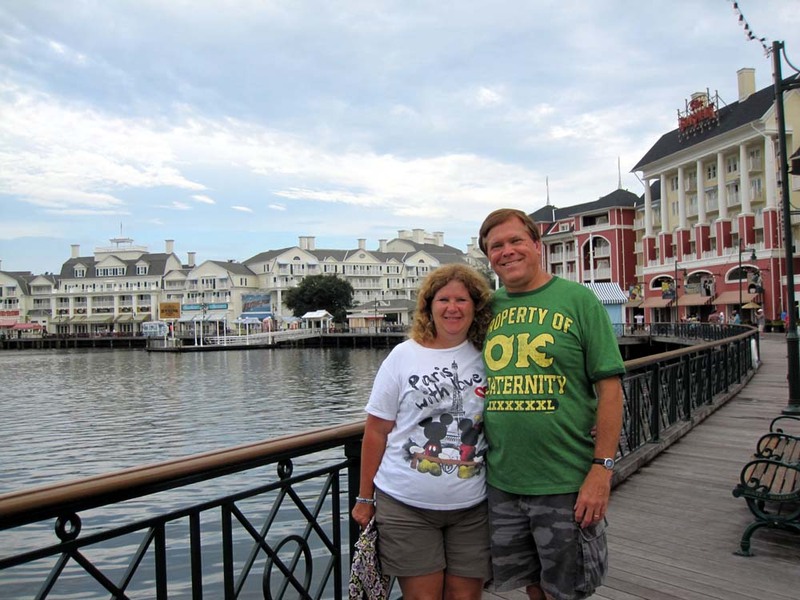 In the 90s Kelli and her family would always dream about staying in the treehouses when they stayed at Disney's Dixie Landings (now Port Orleans Resort Riverside). They would take the boat to Downtown Disney and along the water way they would see the treehouses, poking out of the forest. Wouldn't it be cool to live in one? 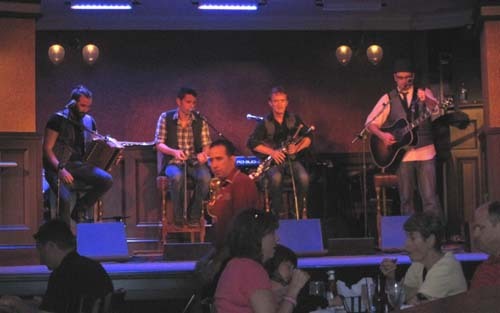 In 2007 I saw them for the first time on our Disneymoon when we stayed at Port Orleans Riverside. I too had the same dream but then I read they were formerly used only for housing for International College Program Cast Members. They closed for good in 2004 due to damage during Hurricane Charlie. It was not meant to be. 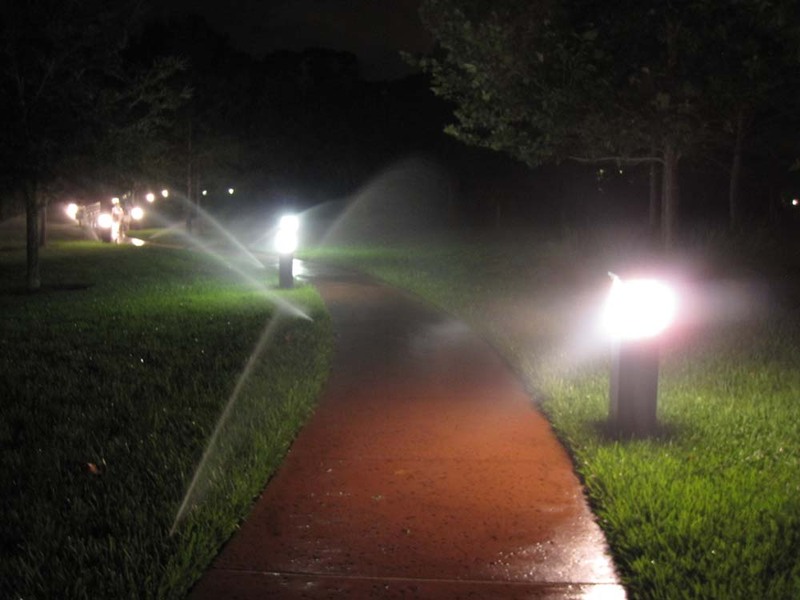 But then there were rumors that they were trying to find a way to make them compliant with the Americans with Disability Act laws and South Florida Water Management restrictions. With some ingenuity they were rebuilt in 2008 and opened in 2009. 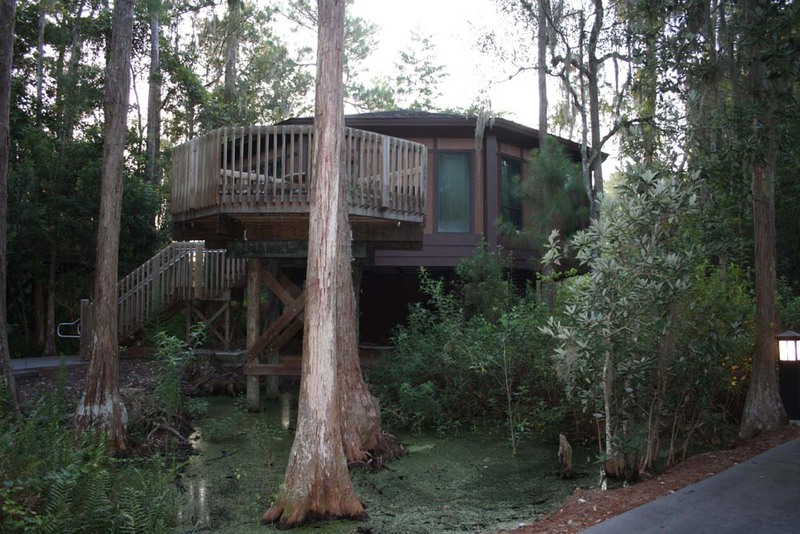 Kelli and I brought into the Disney Vacation Club in 2011, we choose Saratoga Springs as our home resort to make this possible one day to stay in a treehouse. It only took a couple of years to borrow and bank enough points to make this all possible. We had nine adults, just right, Kelli and I, Kelli's sister and brother-in-law, their four boys and one daughter-in-law (our nephews and niece). We chose August as Kelli's sister and our niece could only go when school was out. We had to move the stay back one week to accommodate another nephews wedding. We made the reservation in September 2012 at the 11th month mark and all was set. There was one change. Kelli's sister and brother-in-law bowed out for family reasons. But it will make life in the treehouse a lot roomier. Tim, Marissa, Kelli and I are on the same flights down and back and will be staying for the full week. The other boys are arriving the same day, but will only stay till Wednesday. Our plan the first day is to check in, then shop the outlets stores and grab food and necessities at Publix till the villa is ready. We are all flying out Saturday morning, but on three different flights on JetBlue out of JFK airport, NY. Kevin is first at 7:40, Tim and his wife Marissa along with Kelli and me at 8:40 and Mike and Rich at 10:21. To make the drive to the airport easier for my brother and sister-in-law, the four of us at 8:40 will travel with Kevin driven by my brother-in-law Rich Sr. Mike and Rich will head out later with their mom, my sister-in-law Joan driving. That meant we’d have to get up earlier than planned. 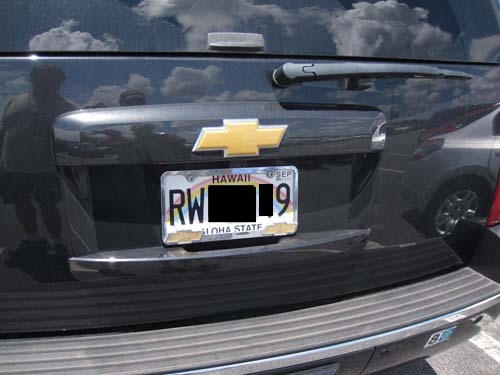 I also switched the rental car to Enterprise when they finally dropped their rates a week before departure. Kelli and I woke up at 4 AM and were picked up at 5:15AM with Kevin, Tim and Marissa already in the car. We were a little worried about construction on the Hutchinson River Parkway. The state was replacing a bridge in a 6 day marathon. Fortunately, the detour was a breeze and with no traffic made it to the airport quickly. Security was moderately heavy. We had a long wait so we ate breakfast at the cramped and packed food court in the JetBlue terminal. Kevin’s flight was just two gates down. His flight ended up leaving 50 minutes late and we figured we might even beat his flight down; but we got stuck on the tarmac for 45 minutes. They had to shut down our plane completely to reboot the computers on board. After that the flight had no issues. JetBlue did give us free movies for our delay and I got to see the sci-fi movie Oblivion for the first time. 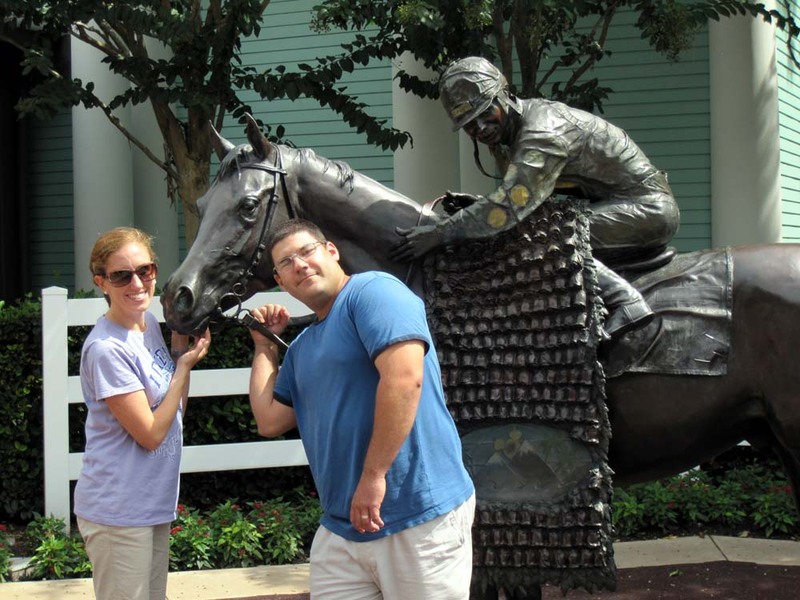 Kelli, Tim and Marissa took DME over to Saratoga Springs while I picked up a standard car from Enterprise. I had the most annoying Enterprise employee in the parking garage, who repeatedly tried to upgrade me for more money. 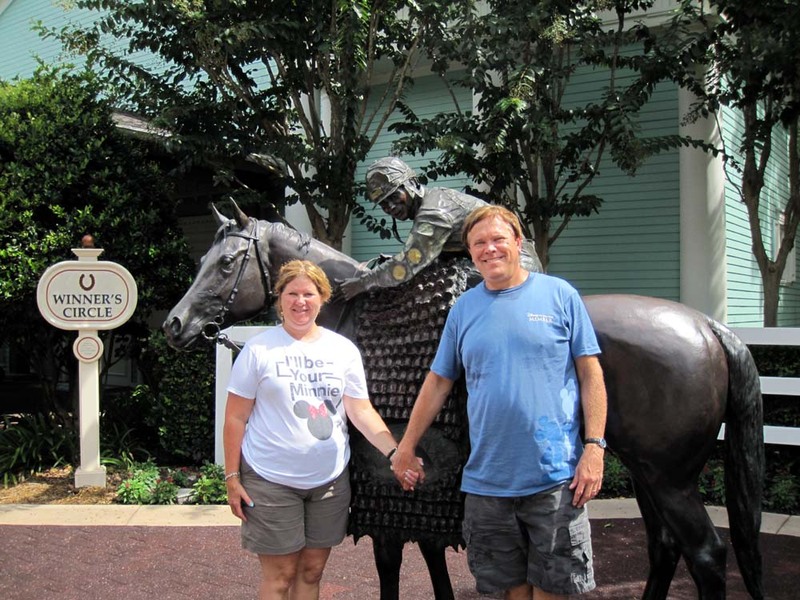 We arrived at Disney’s Saratoga Springs Resort Carriage House about the same time, Kevin was there waiting for us and had just arrived 15 minutes earlier. Check in was easy and we received our packet with all the room keys in minutes. The Treehouse Villa wasn’t ready as expected so we stored everyone’s carry-ons in the car. I gave our group a tour of the Carriage House, Artist’s Palette, and the High Rock Spring Pool. A Treehouse bus was just pulling up so we hopped on over to show how the internal bus system worked. We got off the second stop and showed them some Treehouses, and the paths to Downtown Disney and the Grandstands. We walked backed through the Grandstands to the Carriage House to wait for Mike and Rich. They arrived shortly after and we checked their luggage with bell service. We walked through the Artist’s Palette and took the back stairs to an awaiting boat to downtown. It docked at the West Side and we headed for Guest Relations next to Disney Quest. Tim and Marissa upgraded their Annual Passes to the RFID cards, we had to pick up our Annual Passes Plus tickets from the great DVC owners deal, and Kevin, Mike and Rich bought 4 and 5 day park hoppers. Mike and Rich had some difficulty; they pre-bought but did not have their confirmation number, searching online and cell call solved that. While this was happening Marissa and Kelli shopped in the House of Blues and Curl by Sammy Duvall stores. An important thing to note here is that we never linked our tickets to the room keys. That will be a big deal due to the testing of the Magic Bands during our stay. I had heard a rumor that due to the test phase, your room key and your ticket can both get Fastpasses, if not linked, this turned out to be true! We walked back to the Carriage House via the path along the Cirque Du Soleil parking lot. Lunch was at the Artist’s Palette and everyone was quite happy with the food here. Most had the flatbreads which are generous and delicious. Kelli and I shared the Cheeseburger Flatbread - Ground Beef, Onions, Pickles, American Cheese, Lettuce, Tomatoes, Mayonnaise, Ketchup, and Mustard. It was plenty for two. I checked to see if the room was ready, it was not but they said it should be in 20 minutes. After 30 I checked again, but still not yet. Amber from Georgia got on the phone to see what the matter was. It seemed our villa had a slow draining tub. They were waiting for the plumber, but opened up the villa to us if we didn’t mind the guy showing up to fix it. No problem, we were eager to get to the villa. We had villa 7031. Tim, Marissa, and Kevin walked over and while Mike and Rich retrieved their luggage, I went to get the car to drive Kelli, Mike and Rich with everyone’s carry-ons over. We arrived at Treehouse 7031 at the same time, right next to the south bus stop and the path to the Grandstand section. It was exactly what I requested! I could not believe our luck. It was one of the houses we looked at on our earlier tour. The accommodations were fantastic. We all love the décor. Kelli and I had the master bedroom. The master bath was outrageous with the glass walk-in shower and whirlpool bath. Tim and Marissa had the room with the full bed. Mike and Rich took the bunk bed room. Kevin was Ok with sleeping on the pullout sofa. We had fun with the hidden Mickey table in the living room. We ask if they could find the hidden Mickey. Some were looking for a small detail on the table instead of the giant hidden Mickey in their face. Kevin, Mike and Rich relaxed at the villa to wait for the plumber, while Tim, Marissa, Kelli and I went shopping. It was Saturday; the traffic would be horrendous near the Publix next to the Premium Outlet Mall and due to Saturday evening mass at the nearby church. I made a good decision and drove to the Publix near Celebration. We picked up lots of food, charcoal, beer, and three cases of water (buy 2 get one free). I thought that would be too much, but we drank it all by Wednesday. 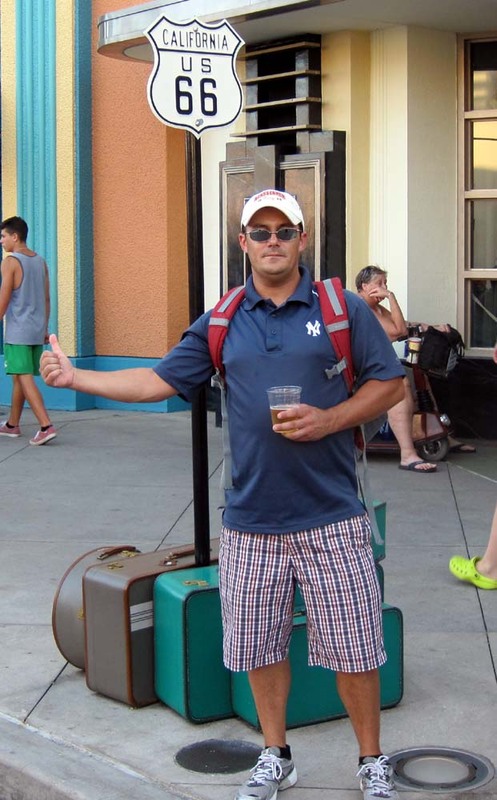 When we got back the plumber was finished, our DME luggage had arrive and after some unpacking we all walked over to the Grandstands for a bus to the Magic Kingdom. I will note that we rarely used the Treehouse bus. The walk to the Grandstand bus stop was not that bad, 5- 10 minute walk, similar to a walk from the farthest room at Pop Century to their bus stops. 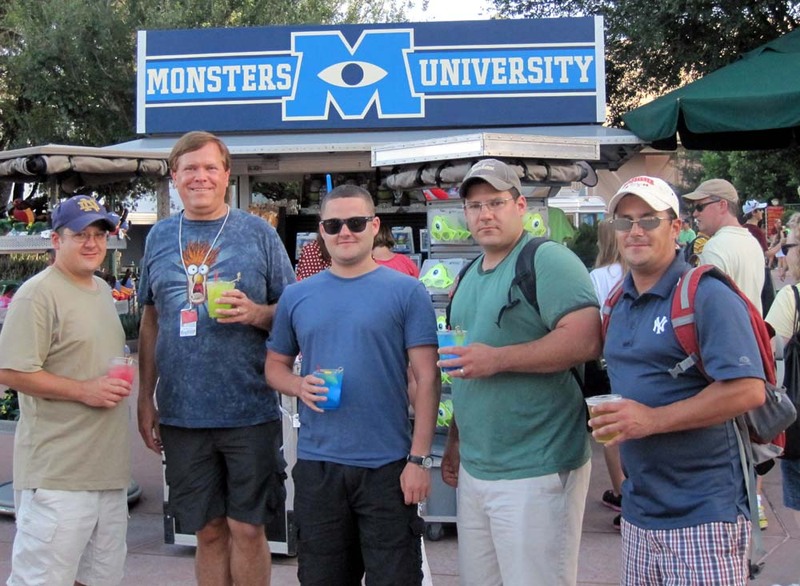 Once at MK, we decided on Monsters, Inc. 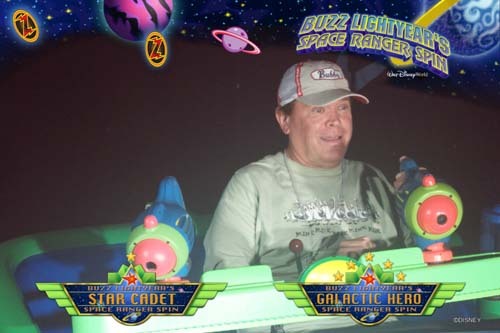 Laugh Floor first, but not before picking up fastpasses (FPs) for Buzz Lightyear's Space Ranger Spin. This was followed by the Tomorrowland Transit Authority PeopleMover. 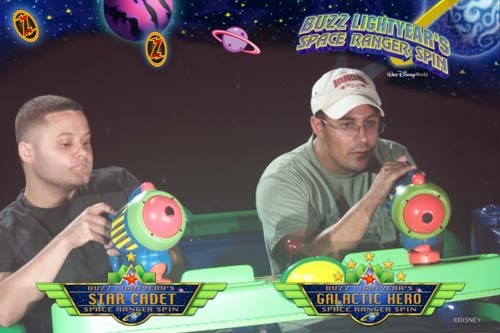 We then did our first ride on Buzz. Kelli and I re-rode the PeopleMover while the rest did Tomorrowland Speedway. We met up and had a restroom break before heading over to the hub in front of the castle. We caught the last of the Main Street Electrical Parade. Rich ran for ice cream for Kelli and himself back to Tomorrowland. By the time he got back it was melting all over the place and he only grabbed two napkins. We all thought it was funny. A mom saw their predicament and offered them baby wipes to clean up the sticky mess. After the parade passed we moved onto the street of the hub. The street remained with plenty of room to move around. People still crowded themselves on the sidewalk. Why??? My nephews and niece have never seen the Celebrate the Magic Castle Projection Show. They were impressed. 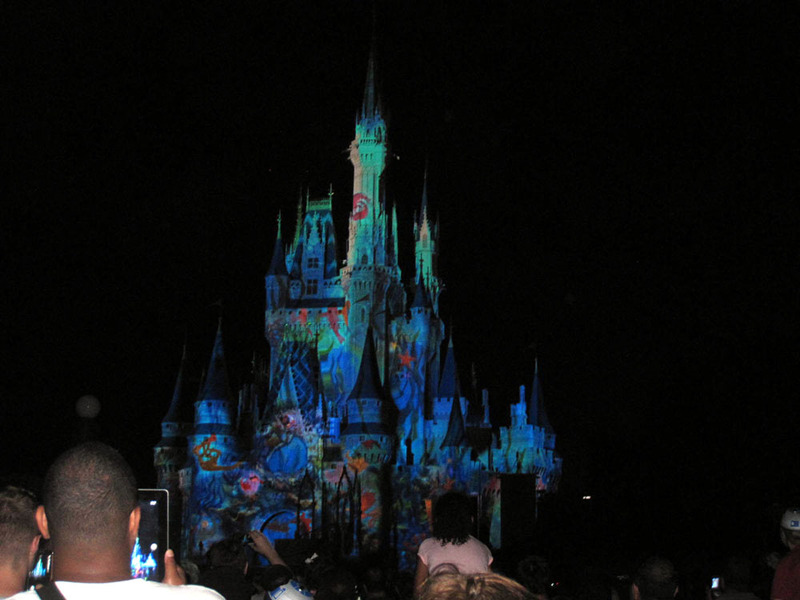 Wishes Nighttime Spectacular followed. The park was still open for another hour so we split up. 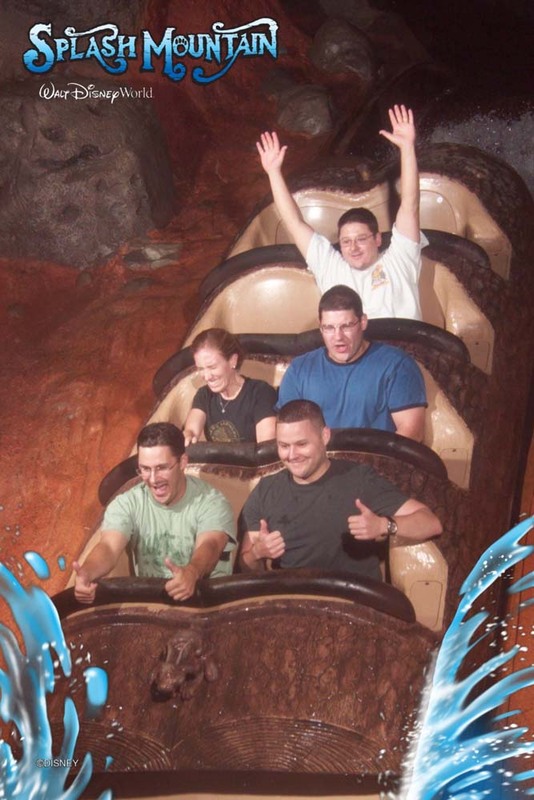 Most went to get on Splash and Thunder Mountain. I had forgotten to get my photopass plus card which I had pre-ordered, so I headed down Main Street. Kelli shopped on Main Street. I back tracked to Tomorrowland to pick up the photos from Buzz. Kelli and I headed back to the Treehouse Villa and had one of the dumbest people I’ve seen on a bus. This guy with his family was standing and would not move back so more people could get on even though the bus driver requested it four times. The guy even commented that people were still trying to get on the bus, so he knew of the situation. This clueless moron finally moved after someone in the front yelled out loudly to “listen to the bus driver” We wasted 5 minutes waiting for this guy to move. 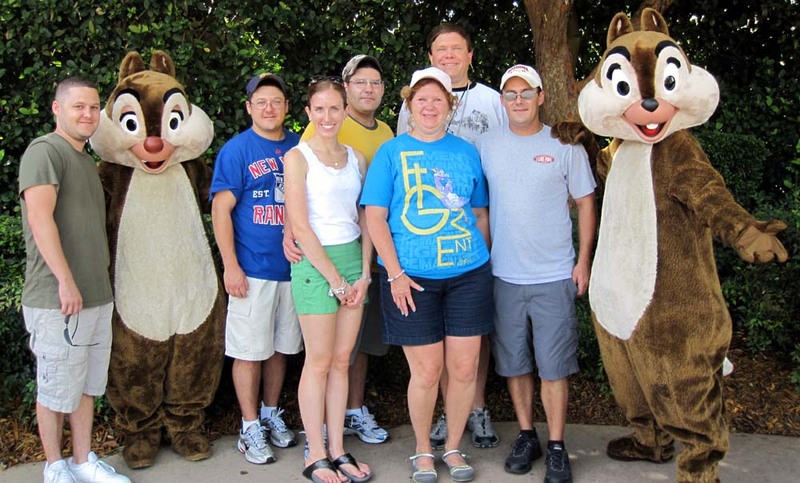 I believe there should be a minimum IQ for adults to visit Walt Disney World. It was a great first day. I wasn’t sure we would have time or energy to get to a park but very glad we did. We were finally living in a Treehouse. My worries about how hard it might be from getting to and from the parks were eliminated. Our plans were to leave by 8 AM to be at a park by opening. I got up early, about 6:30 AM. Marissa was already out jogging her six miles. Everyone else was still sleeping. I later found out Marissa had trouble figuring out the jogging trail for Saratoga Springs from the tree house area. Her cool GPS running tracker recorded her movements and we later watch how she navigated the resort on a map on a computer. She backtracked a few times and circled the pond twice. Later on our trip, she did figure out how to make her way around the resort. I quietly made coffee. People slowly rose. To save time most people had cereal, but we were still a little slow in getting ready – the villa is just too comfortable. We walked to the Grandstands about 8:45 to hop on an Epcot bus. We had a great bus driver, Patricia from New Jersey. We joked back and forth about how different it was driving a bus in Walt Disney World vs. a school bus in and around NJ and New York City. 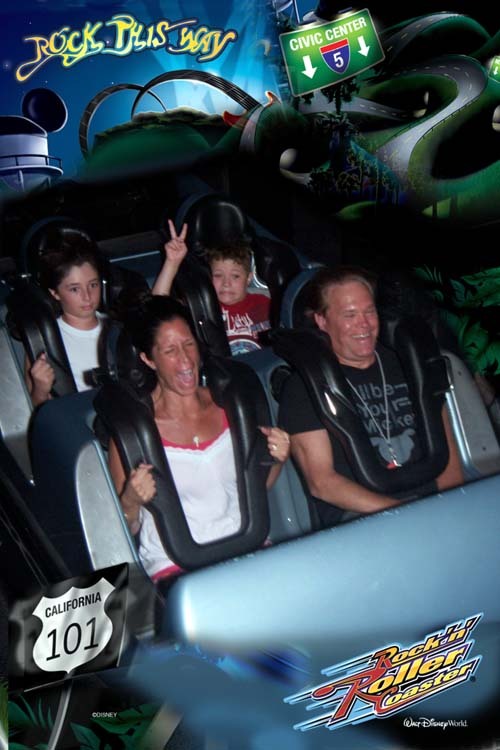 She also provided the riders with jokes and very helpful hints on visiting the parks. 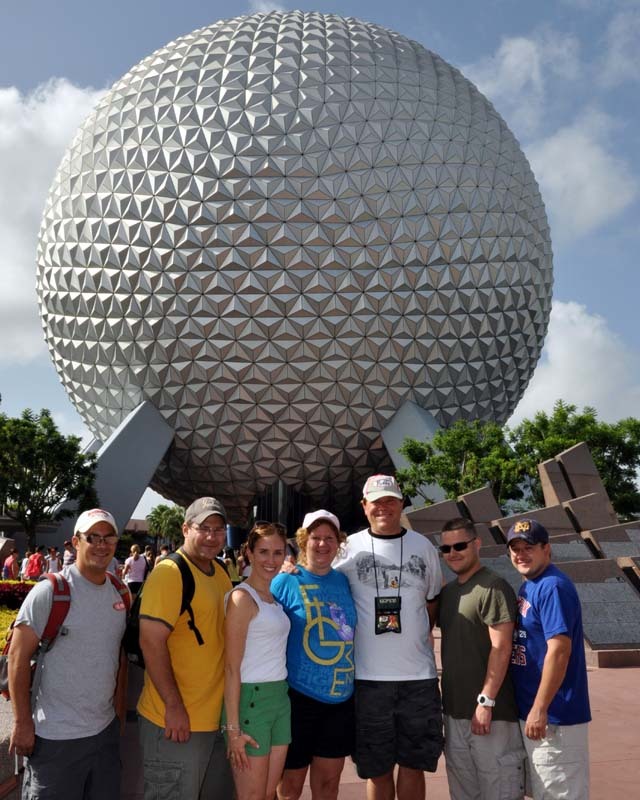 We took a group photo in front of Spaceship Earth to start the day. Crush was in his best form and he seemed to do move improv and audience participation than in the past. Dory and the crowd still called in the whale, but Crush asking to explain a human item was missing. The manatees were out and we watched them swim back and forth, sometimes on their backs and twisting around. They seem to be doing it to delight their audience. 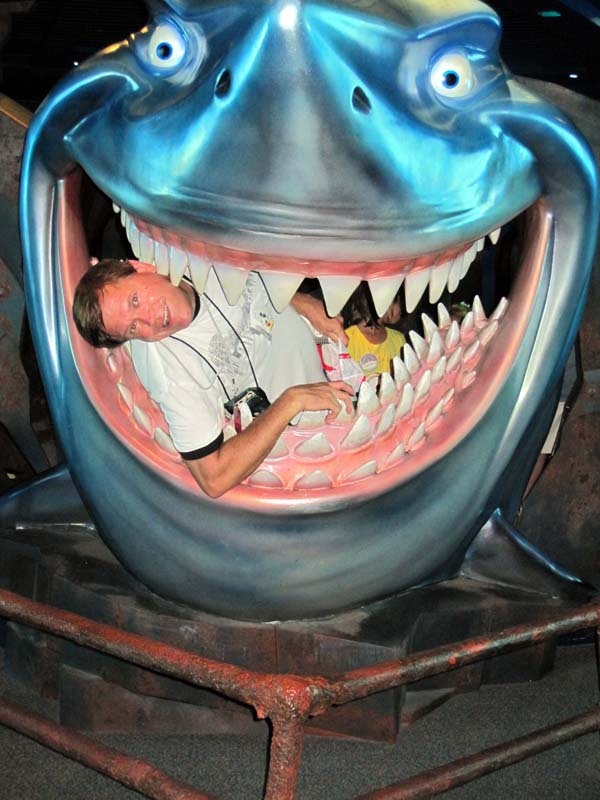 We took a few pictures with Bruce the shark. I hung myself out of his mouth. Bruce’s teeth dug into me and I ended up with a nice bruise on my side. 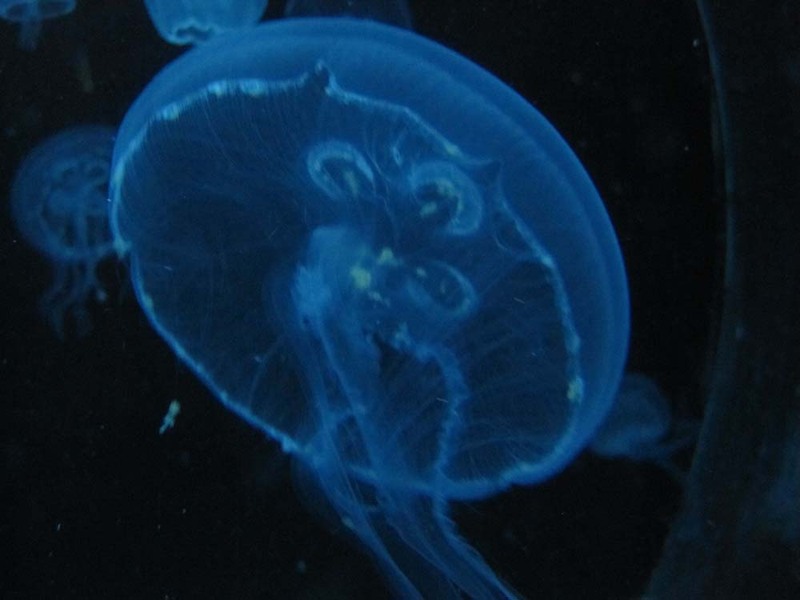 Fish are friends - not food. But that doesn't include humans. But the picture was worth it. 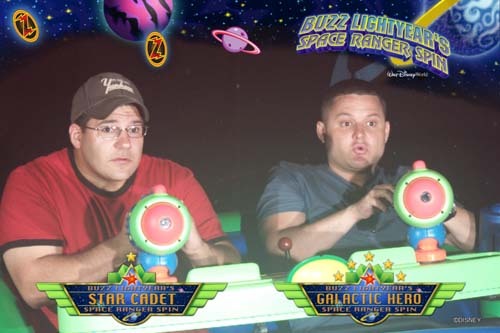 We crossed over to Mission Space and did the intense orange side. Kelli sat this one out. I think I am riding this too much. I am getting used to the G-forces, it did not feel as intense, but I still enjoyed the ride. Before leaving the area we picked up fastpasses for Test Track in the afternoon. We stopped for the restroom and met up to watch and listen to the JAMMitors. After the show they let one guy bang on the cans, he was one heck of a drummer. We still had plenty of time before our Soarin’ fastpasses so Kelli and I did something we have not done in a long time – wait on line for Spaceship Earth, about 20 minutes. We still had time, so all seven of us had lunch at my suggestion at Sunshine Seasons. Kelli and I shared a Caesar Salad - with Oak-fired Chicken, others had salads, Mongolian Beef and Sunshine Seasons’ wonderful soups. Everyone was again very pleased with their meals. Vacations are just better when the food is good – so read reviews and plan wisely. If you are looking for something different than the standard fare, try eating in the Land Pavilion. We soared over California after lunch then finally headed to the World Showcase. Our plan was to eventually drink around the world. 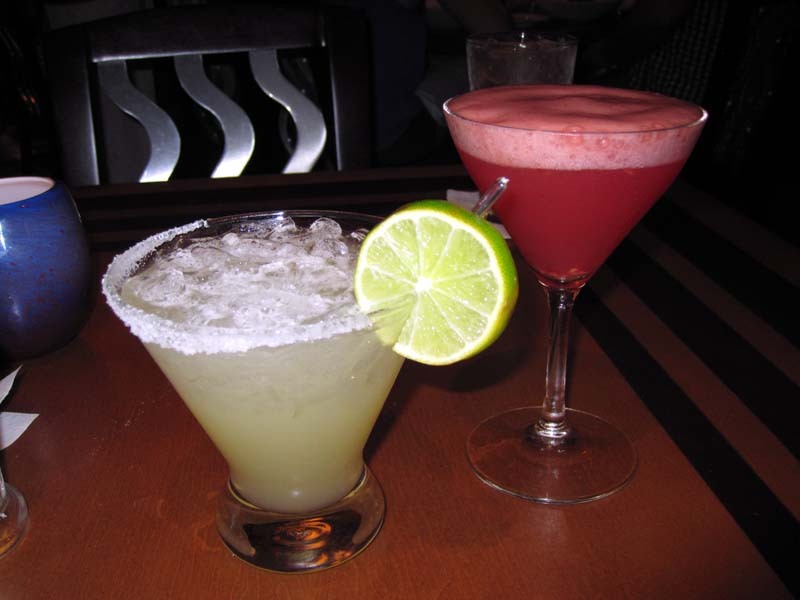 Having or sharing a drink in each country, while enjoying shopping, sights and shows. Our first stop was Canada, with most getting a Moosehead Light or Labatt Blue beer. I ordered a Torontopolitan (vodka, creme de cassis, triple sec and cranberry juice) so Kelli and I could share a drink. 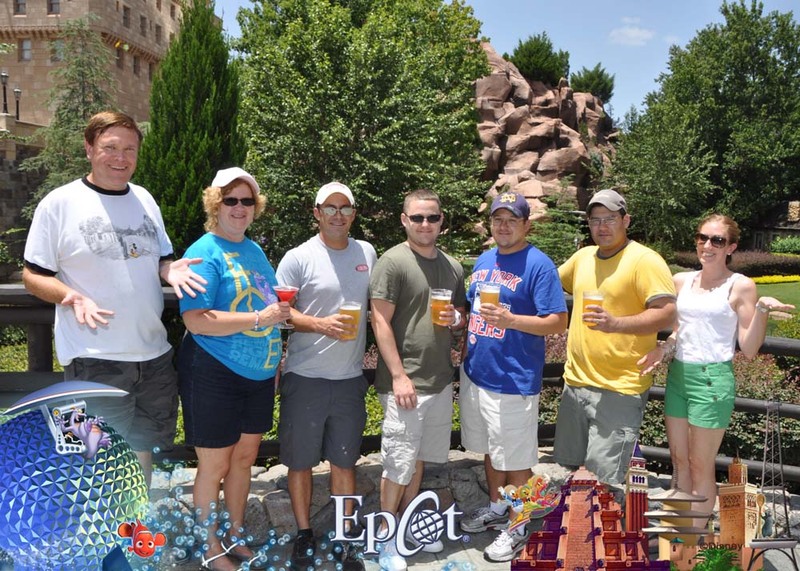 We found a great photopass photographer and had us pose with our drinks. We later ran into her in Japan and got even greater pictures. Next was the United Kingdom where we did some shopping. I let Kelli finish the Torontopolitan and I ordered a Magner’s Pear Cider. It was tasty and refreshing. Some of us watched the World Showcase Players begin their “Romeo and Edna” skit while we waited for everyone to regroup. I forgot to buy my Tables in Wonderland card for dinning discounts, so I let the group travel over to France while I went out the International Gateway to Guest Relations. I still had my Magner’s Pear Cider so I had to down it to exit the park. I felt it soon after while at Guest Relations. I reentered the park and met up with everyone in France. Kelli had gotten one of our favorites, a Grand Marnier & Grey Goose Orange Slush and shared some with me. Others got wine, Kronenbourg 1664 beer and a Grey Goose Citron Lemonade Slush. Kelli made a note that next time we will try the lemonade slush. We watched some Serveur Amusant jugglers before moving onto Morocco. Mo'Rockin was playing and were just finishing their set as we passed so I missed a good view of the belly dancing. Japan featured more shopping and exploring the gardens while five of us tried the sake cocktails, I tried the banana while other tried lime, green apple and pineapple. The banana was different and good, but I will try a new flavor next time. 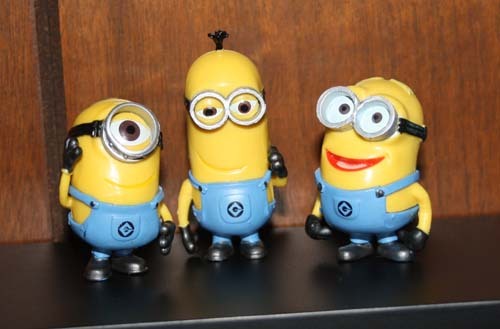 Kelli thought that I got the banana since she is not fond of bananas, and I do not have to share – guilty! We ran into the same photographer and we got some great pictures in front of the torii gate. Some of us picked up beers in USA and Germany. We saw one of the effects from the Phineas and Ferb: Agent P's World Showcase Adventure, with Dr. Doofenshmirtz getting chased off with a broom. 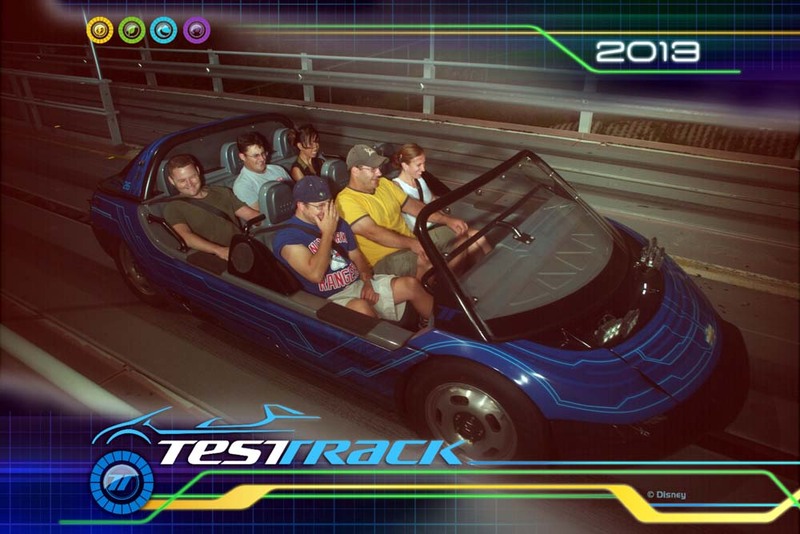 Our test track fast pass times were approaching. 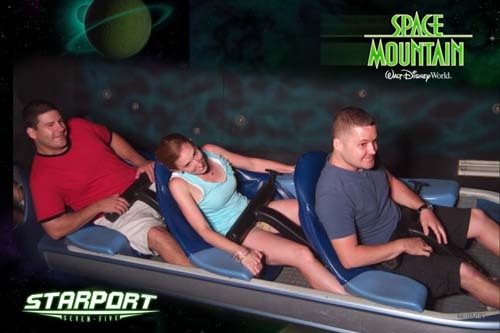 Kelli was getting a bit overheated so we let the others race up to Test Track to ride while we took our time shopping in the Showcase Plaza to cool off. 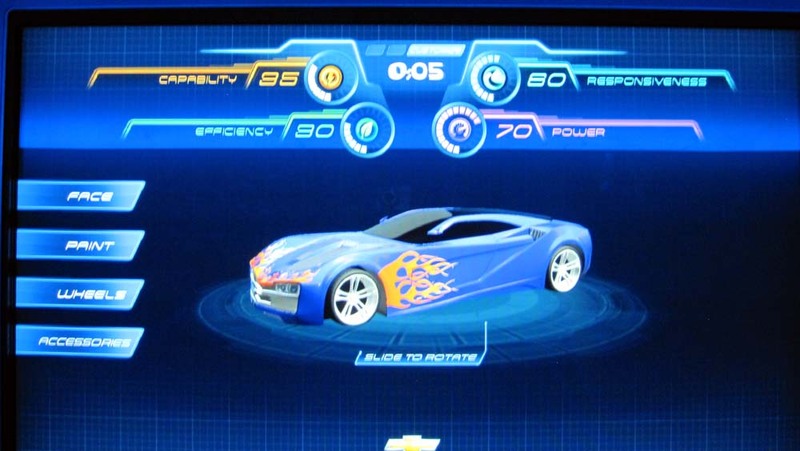 We then waited at the end of the ride in Chevrolet interactive area. I played with one of the virtual games steering a car around a track. 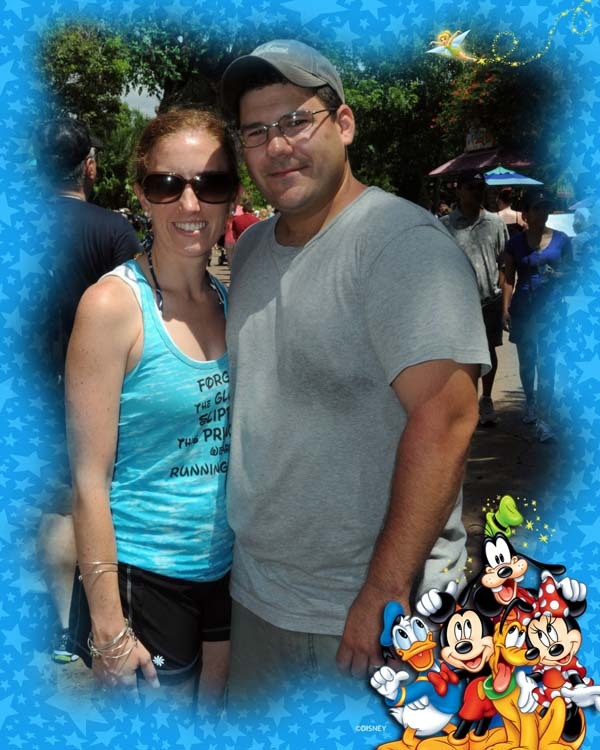 We met everyone at the ride photo area and added the picture to my photopass plus card. Tim and Marissa headed back to the villa to hit the High Rock Spring Pool and have dinner at the Artist’s Palette. 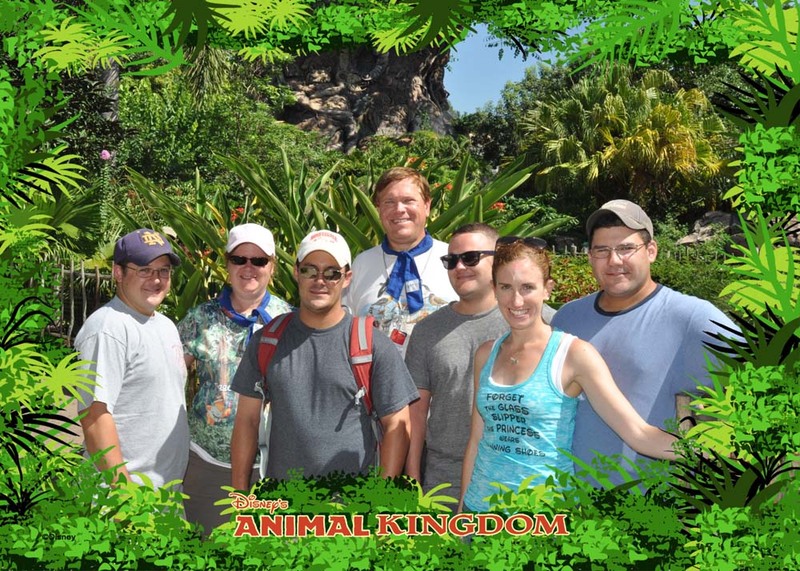 Rich, Kevin, Michael, Kelli and I took an Animal Kingdom Resort bus for our 5:45 ADR for Boma – Flavors of Africa. We had some time so we walked out back of the lodge to leisurely view some of the animals. 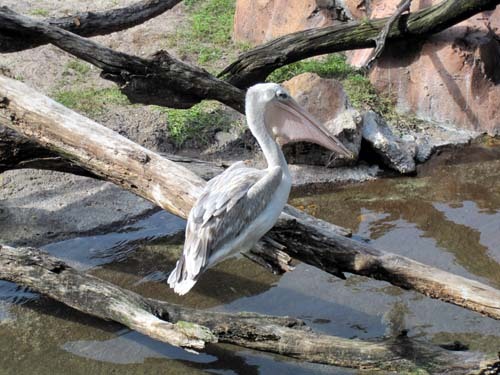 Pelicans, Ostrich and a pair of giraffes were out. We headed back in to Boma. We were seated within minutes and sat close to the beginning of the buffet. One of the dishes was Marissa’s Salmon (although that M might have been an H). We found it funny since Marissa usually orders salmon at restaurants but didn’t join us for this meal. The boys really enjoyed the meal. I think they went up three times. 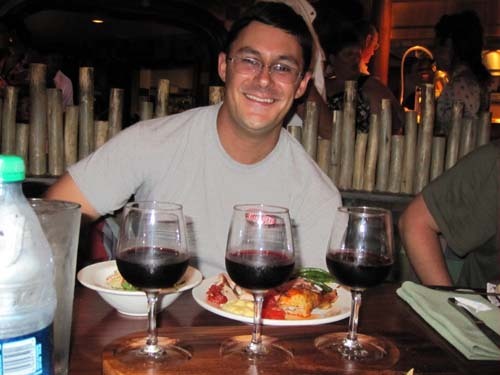 Rich enjoyed a red wine flight. Kevin, Kelli and I thought the soups were amazing. We finished our meal with Zebra Domes and were happy. We took the first bus that showed up which was an Epcot bus and transferred to a Saratoga Springs bus at the park to get back to the villa. 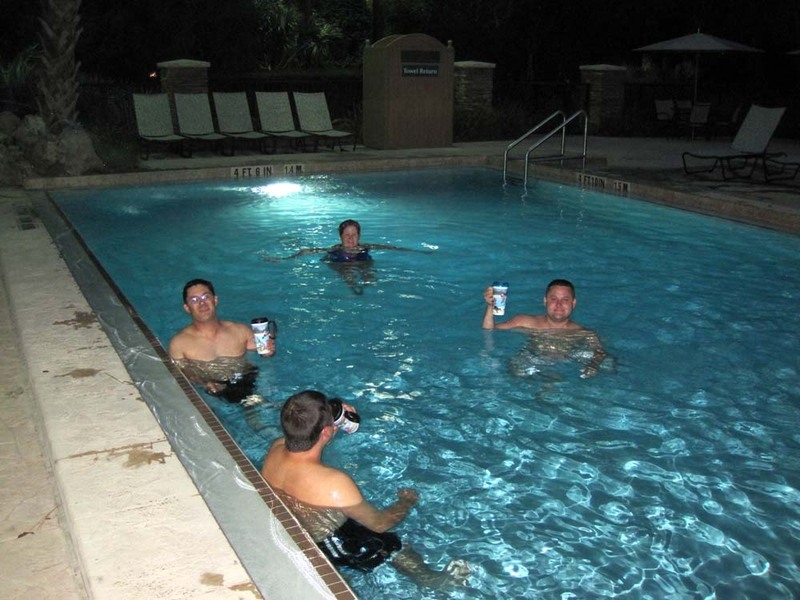 We relaxed at the pool into the night and eventually had the place to ourselves. On our way back we found a harmless Corn Snake on the path to our tree house. We showed it to a couple who had just left the tree house next to us. We all took a ton of photos of this beautiful orange, black and yellow snake and then left him alone as he slithered into the brush. This was an enjoyable day, spending time and drinking with my niece and nephews. The pool at night is an excellent way to decompress after a fun, but tiring day. I again got up early. I quietly made coffee, bacon and eggs. The aroma of sizzling bacon helped everyone get up! We did better this time leaving at 8:20 for the Magic Kingdom. 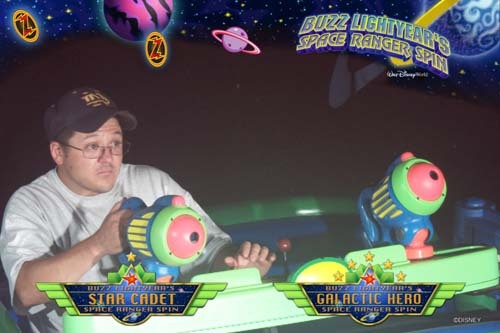 I was hoping to get to the new Fantasyland area early before it got too crowded, but Buzz Lightyear was calling for new recruits. 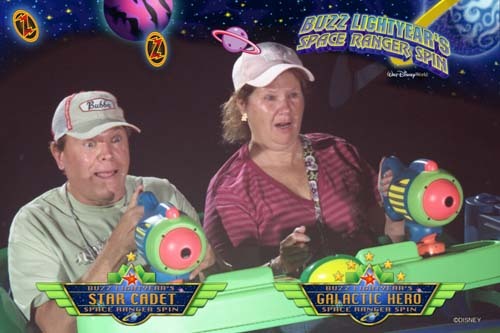 We got fast passes for Buzz Lightyear's Space Ranger Spin and for Space Mountain. The wait for Buzz was short so we went on using the standby line. 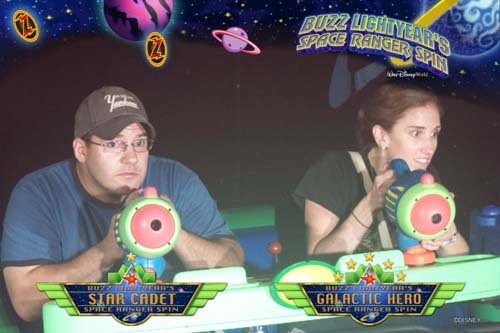 I did not get the high score in the group despite knowing which targets to hit. 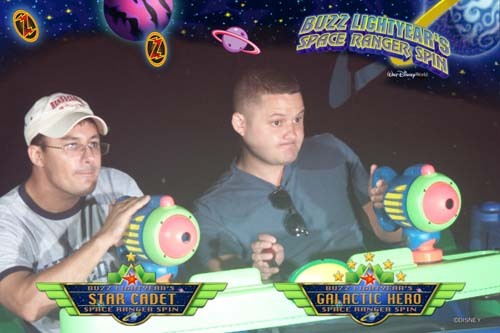 Being tall makes it hard to aim the laser cannon. 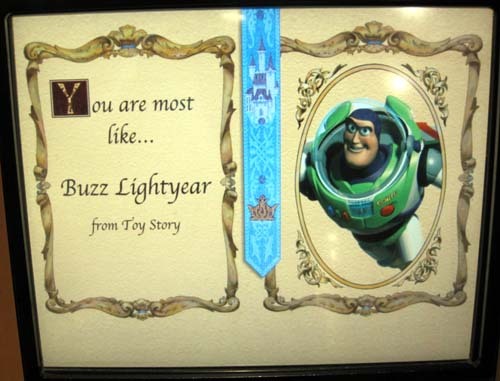 After that we went on Buzz again using the fast passes. 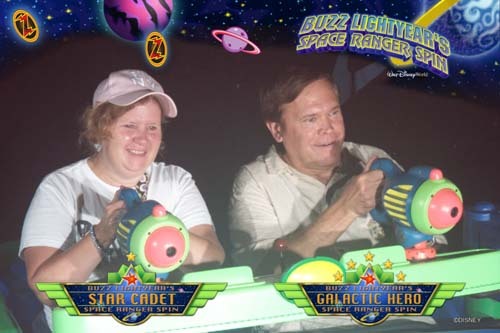 We split up, Kelli and I did another ride on Buzz followed by a ride on the Tomorrowland Transit Authority PeopleMover. The rest got on Tomorrowland Speedway, then used their fastpasses for Space Mountain. 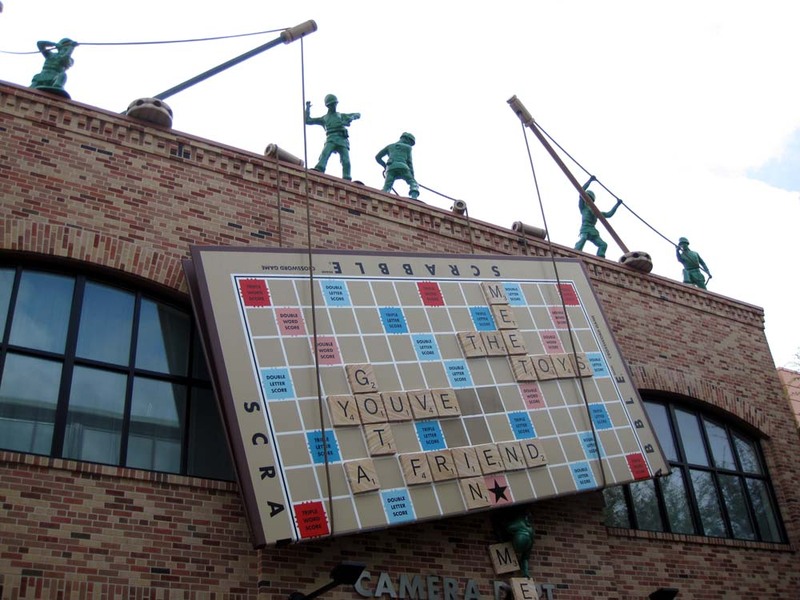 The plan was to meet in the new Fantasyland area. I would get fastpasses for everyone for Under the Sea - Journey of The Little Mermaid and pick up the Splash Mountain ride photo from Saturday night. They in turn would pick up fastpasses for everyone for The Many Adventures of Winnie the Pooh. While waiting for our group, Kelli and I had a LeFou's Brew and noticed that the line for lunch for Be Our Guest ran across the bridge and wrapped around towards Gaston's Tavern. It was only 10:30 AM! Disney did hand out black and white umbrellas to the guest waiting on line to shade them from the sun. The Little Mermaid ride was down so my niece and nephews wanted a ride on Goofy’s Barnstormer. While on line, a stream train came into the Fantasyland station and filled up with water before heading back out. First time I have seen that. 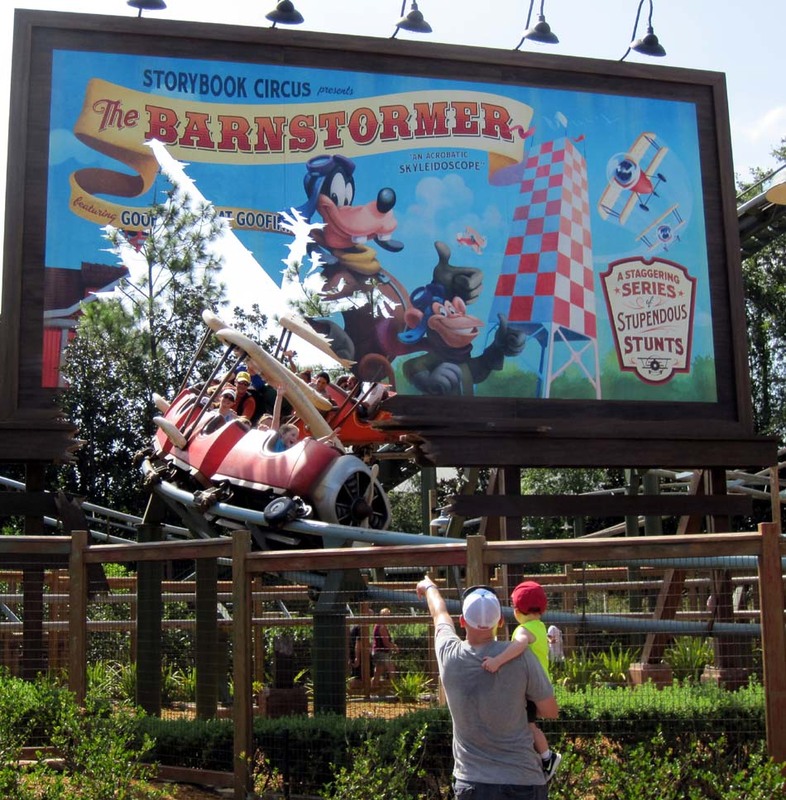 I have never been on Goofy’s Barnstormer and was not sure I would even fit in the coaster. Of course I got the seat with the wing and had to be careful not to hit my head getting in and out, but I did fit. The short ride was rather good. Next was The Many Adventures of Winnie the Pooh. We walked over to The Little Mermaid and the ride had just opened back up and we were on in no time. 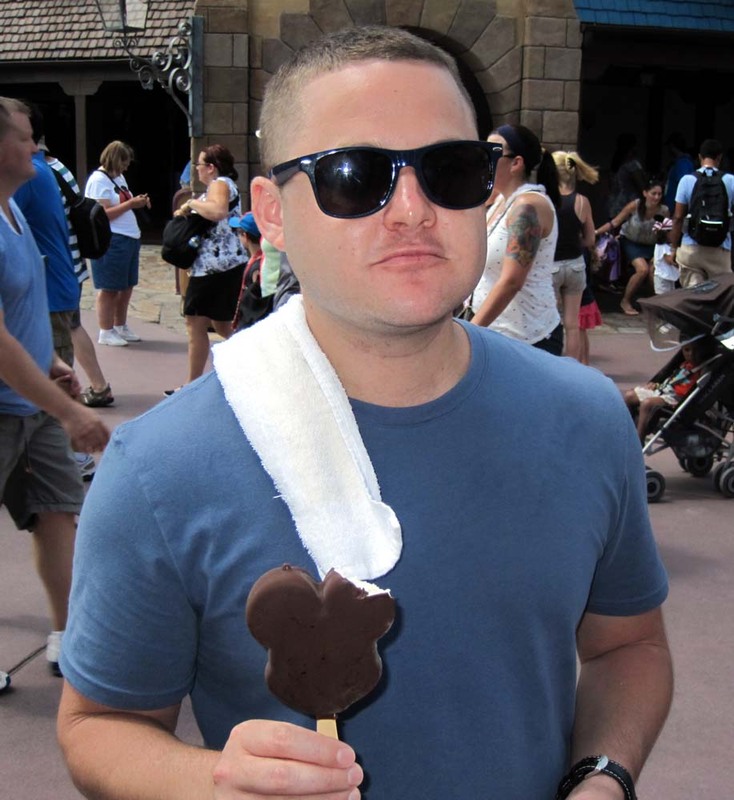 Mike stopped for a Mickey ice-cream bar. Only he could pose with one and still look cool. We headed over to Liberty Square and the Haunted Mansion posted only a 30 minute wait - despite the line extending out to the Columbia Harbour House. I’d thought it would be longer but much of the old queue is now a fastpass plus queue, so the wait was indeed 30 minutes. The line went through the new interactive cemetery, something the boys and Marissa have not seen. Both stretching rooms were working but it was a mob seen afterwards with the masses being funneled down to a single line. Kelli and I always seem to get the ghost that blows off our heads. This ride was no different. We headed for Adventureland using the short-cut through the underpass where the bathrooms are in hope to ride both the Jungle Cruise and Pirates of the Caribbean. Jungle Cruise had an hour wait so Kelli, Kevin and I grabbed fastpasses for a short time later. Yes - you can wait an hour in line in standby – or you could grab fastpasses for 30 minute later. And yes - people were still going into the standby line. All seven of us then rode Pirates of the Caribbean with a 30 minute wait. I saw the new mermaid skeleton but no other mermaids. My niece and three nephews had to leave for Hollywood Studios for their 3:15 PM Fantasmic! Dining Experience at Mama Melrose. 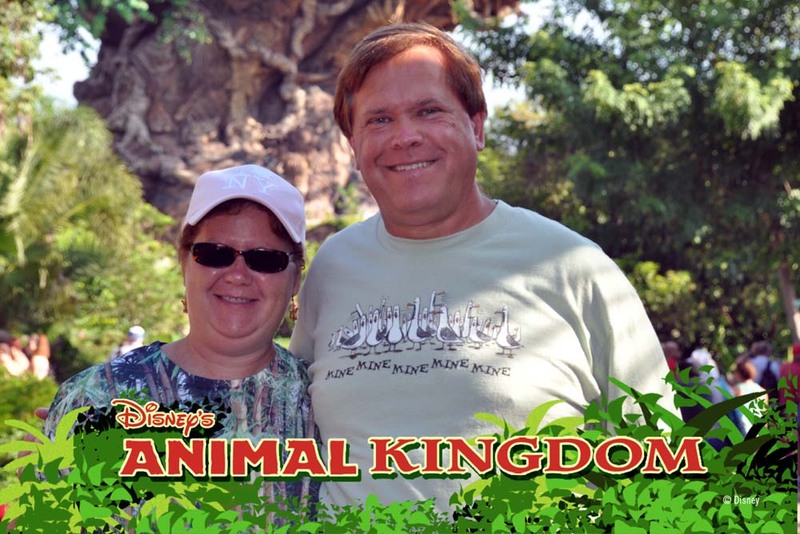 Kevin, Kelli and I remained in the Magic Kingdom and did the Jungle Cruise using our fastpasses before leaving the park. We had a good skipper with lots of new corny jokes. The three of us grabbed dinner at the Artist’s Palette back at the resort and relaxed a bit. I think I tried their Lobster Club Sandwich - Lobster Salad, Smoked Bacon, Lettuce, Tomato, and Lemon Mayonnaise with House-made Chips or Vegetable Slaw. Another dish that did not disappoint. 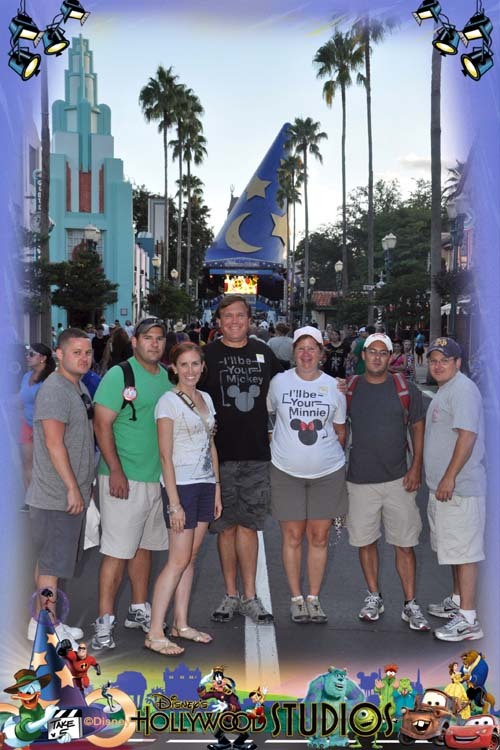 Later, Kevin and I headed over to Hollywood Studios to meet up with the rest of the group. 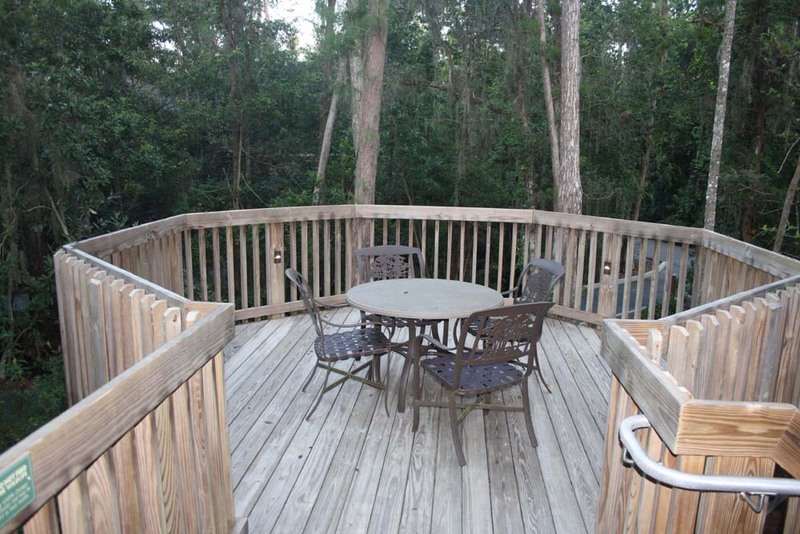 Kelli happily stayed behind to read and enjoy the treehouse villa, especially the deck. 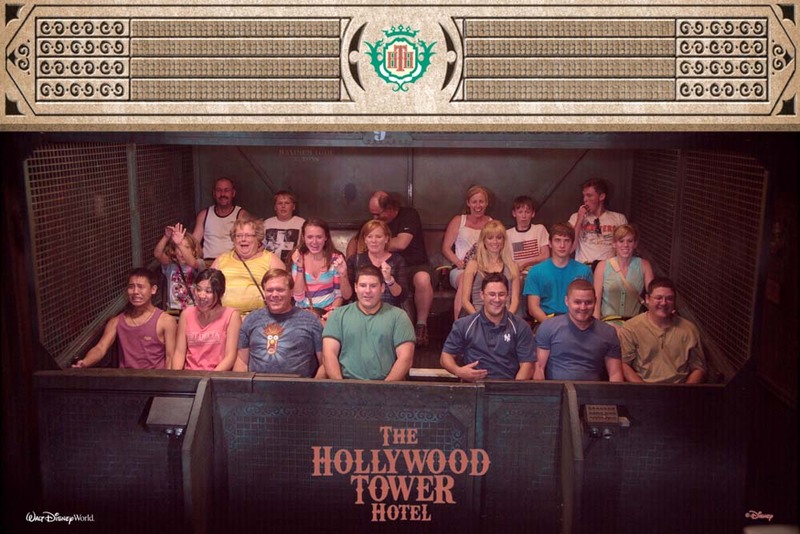 She does not do the studio’s thrill rides. Since it was just the two of us I drove over to the studios. We were quickly there and after a couple text messages we found out our group was on the Great Movie Ride. Kevin and I grabbed fastpasses for the Tower of Terror for about 8:30 PM. We will ride that last before heading in for the night. I later ask how Mama Melrose was with the Fantasmic! Dining Experience. They loved it and said it was a lot of food. It took almost two hours to get through all the courses, but it was worth it for the food, and not having to get in line so early for the show. 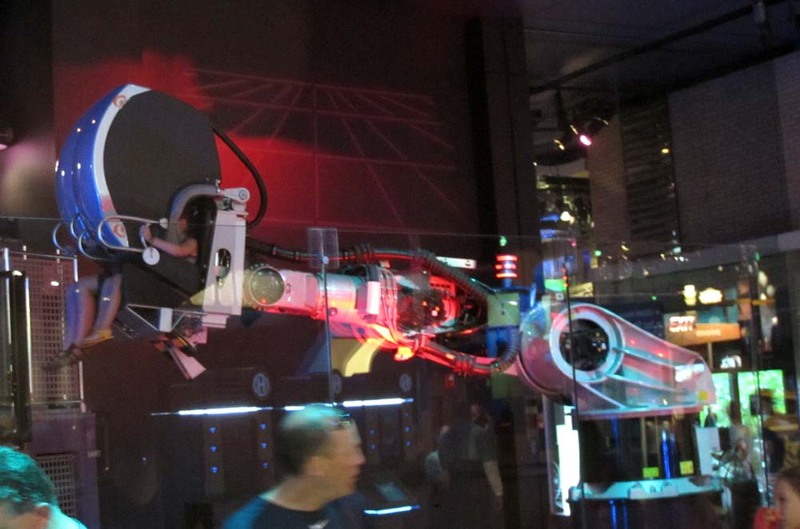 We all met up at Star Tours-The Adventure Continues. 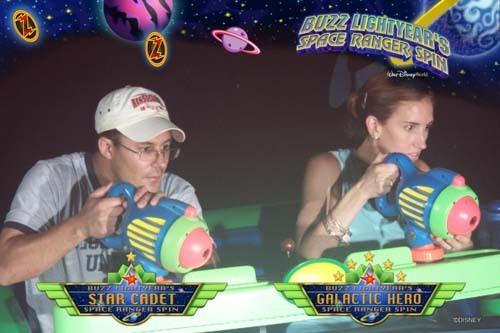 They had fastpasses for Star Tours but we did not. The stand-by line said only 20 minutes so we all first did the standby line together. We had Darth Vader, Yoda, pod racers on Tatooine and the death star. The boys thought the updates were great. Tim and Marissa had one scene that was new to them. The four with fasspasses were going on again, Kevin and I decided to use the standby line. Funny thing happened. We moved at the same speed, never really stopping and Kevin and I made the merge just before they did and we all ended up together. While on line we talked about what other scenes are available, including the ice planet Hoth and the underwater scene on Naboo, my favorite. Guess what, although we had Darth Vader and Yoda again – we had the ice planet and Naboo. We headed towards the Tower of Terror but were sidetracked by the drinks being offered at the Monsters University Homecoming Party. 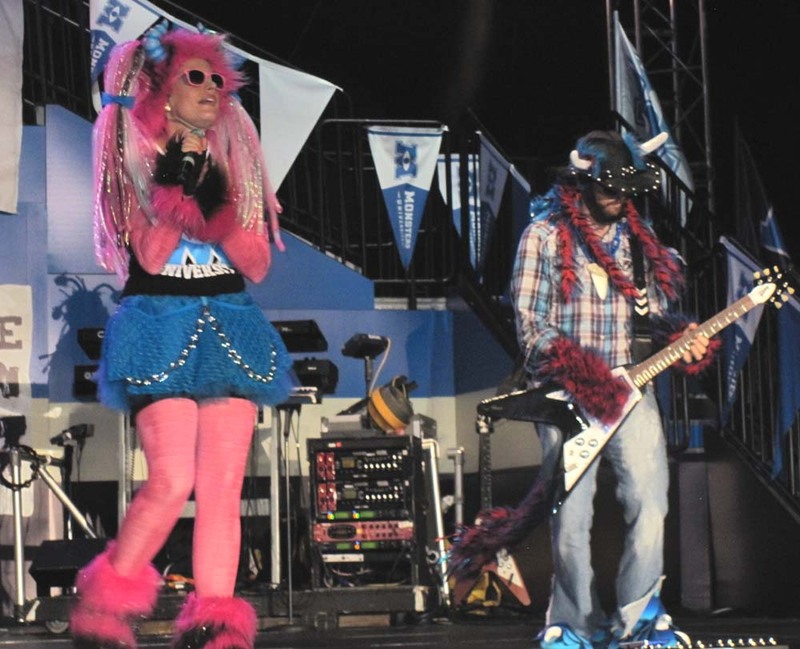 We enjoyed DJ “Monster of Scaremonies” while they had monster games for the kids on the “quad”. On Sunset Boulevard, I had Rich pose with the Route 66 sign as if he was hitch-hiking across the USA. Kevin used Marissa’s fastpass to ride Tower of Terror with his brothers, while Marissa and I waited for them at the ride picture area. When they came off Mike saw the ride picture of them on the screen for a second, and then it went black. Tim said they had some rowdy tour group with them and one of them said they gave a hand gesture. 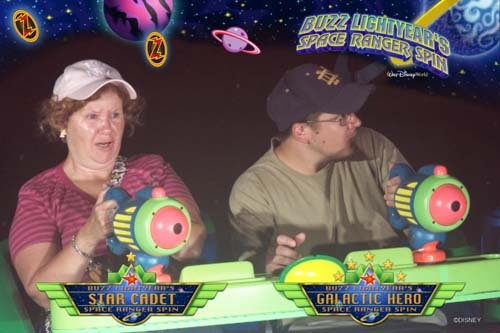 So Disney quickly censored the picture. So there was no ride photo to get. A security guy overheard us talking and he said follow me. We all followed, except Marissa, and he takes us up an elevator ( a real one, not the ride, we made a few jokes) so we could ride again and get a picture. Yes- if you are following - I got on the ride with them. 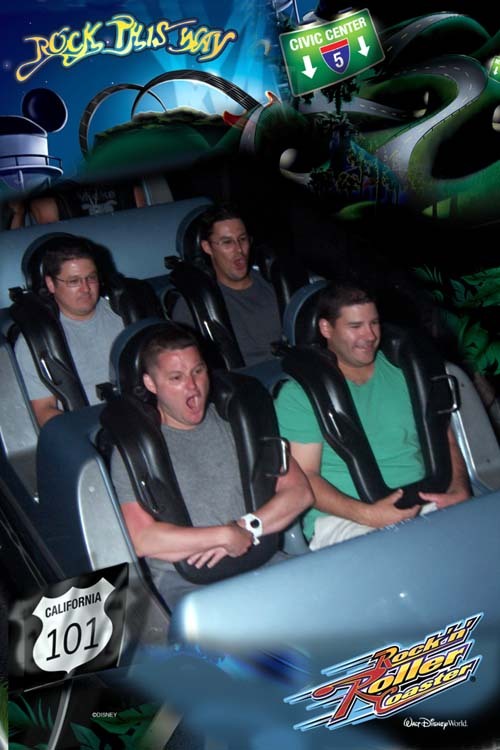 We ended up with front row and it is one of the best ride photos of the trip. Thanks Disney for correcting an unfortunate situation. After that the Fantasmic! group headed on over for the show. Kevin and I used our now current fast passes for another ride on Tower of Terror. Before heading out, we watched some of the Monsters University Homecoming Party featuring a live band called Scare Supply. 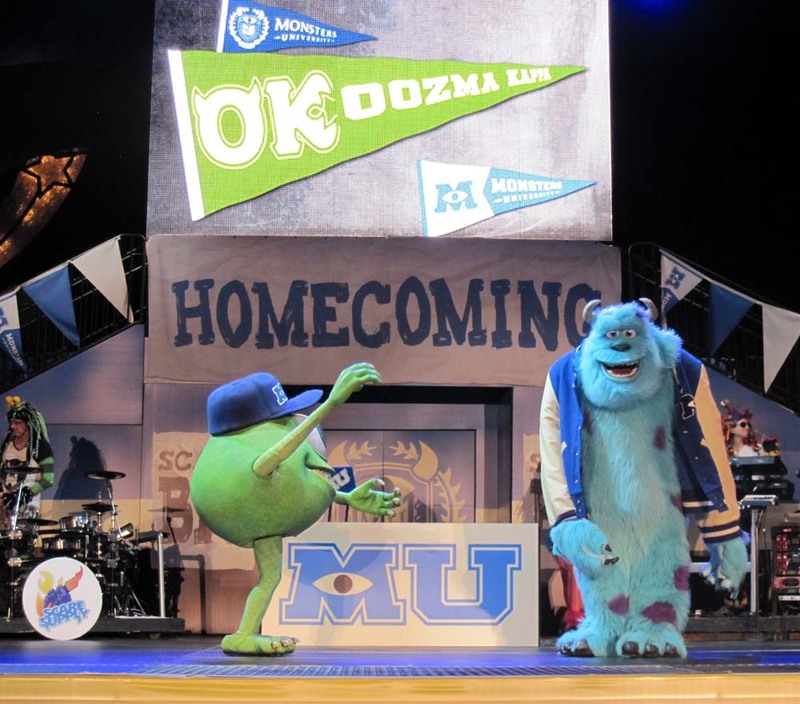 Mike and Sulley came out along with the Monsters University Cheerleaders for a few songs. We left after they finished the Monster University Fight Song. Back at the resort, Kelli, Kevin and I enjoyed an empty treehouse pool and hot tub till the other four joined us after seeing Fantasmic! That hot tub really eases those aches and pains from long days. To save time this morning I made bacon in the microwave. We made it out the door at 8:10 AM. We are getting close to leaving on time! We headed to Animal Kingdom and arrived just as they opened the gates. We first went over to the far left as lines had not formed there yet, but quickly realized that they had the old scanners. We crossed over to the right to find the shortest lines; it still took about 5-10 minutes to get in. Marissa and Mike were our fastpass runners. 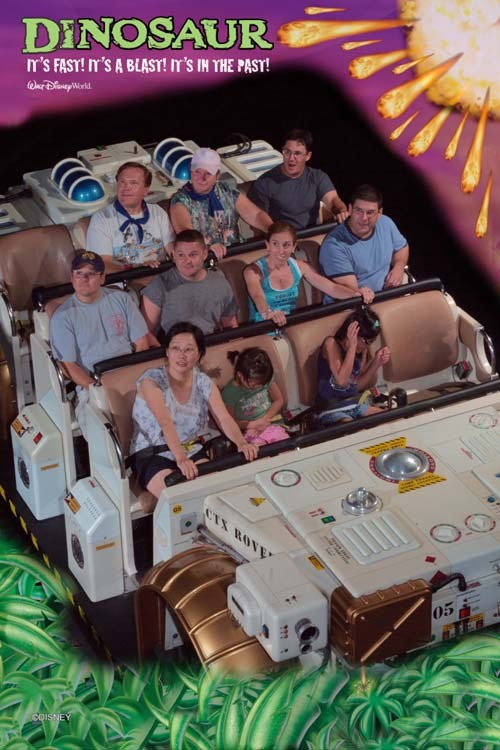 Marissa headed to Everest and Mike headed to Dinosaur. 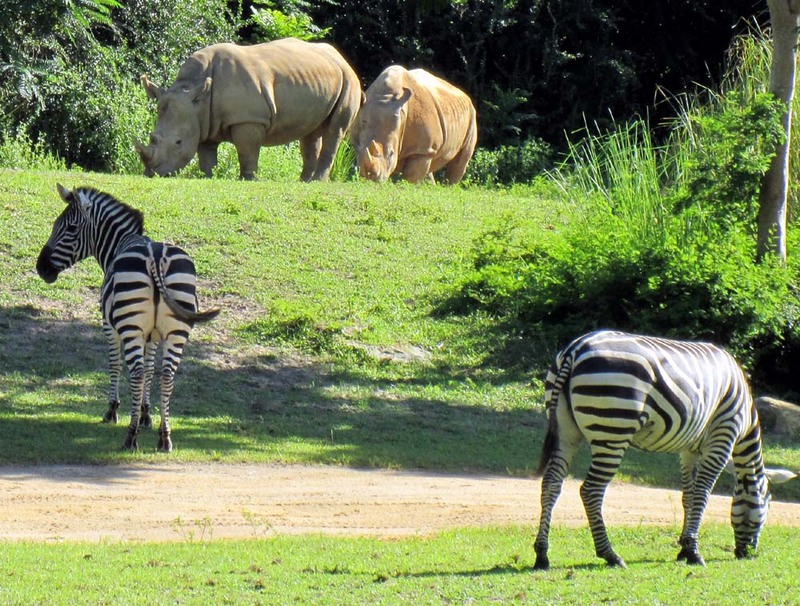 The rest of us walked to Kilimanjaro Safaris. The Giant Anteater was out in the Oasis but we did not stop. Marissa made it back first; with Mike, who had a longer journey, a half minute behind (He did get yelled at by a CM for running). We were soon on the Safari; it was warm and humid and the animals were already hiding in the shade. I noticed the people taking the walking tour more on this trip. They were most evident at the Hippopotamus pool. Very few animals were out and about in the savannah section. 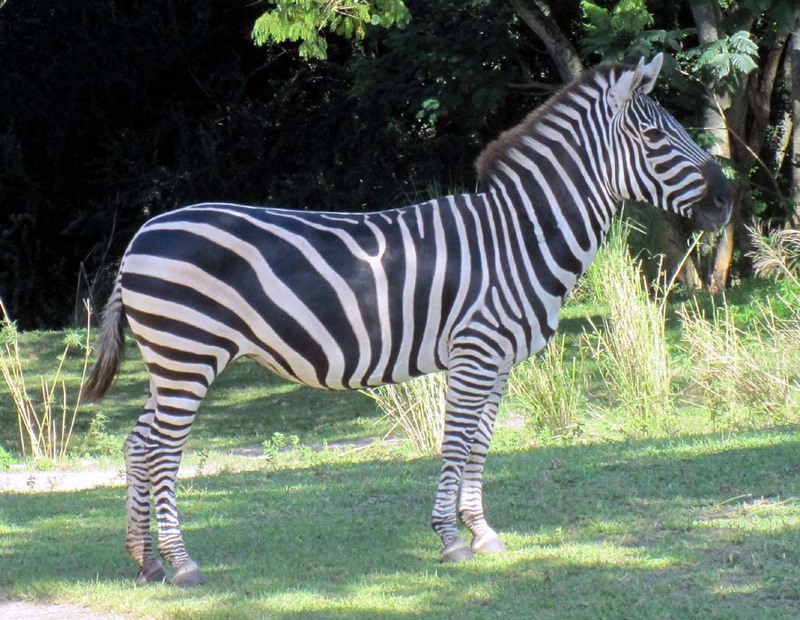 We did get great looks at the White Rhinos and we saw the Zebras out in the last couple of sections. After our two week safari – bathrooms and coffee were in order. 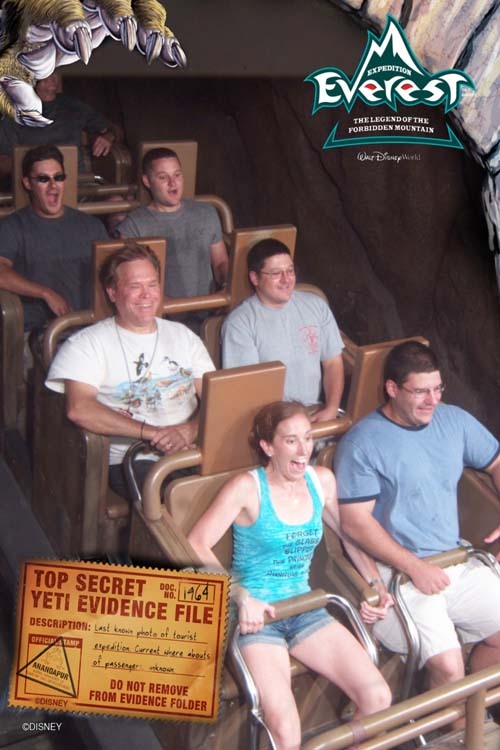 We headed over to Expedition Everest – Legend of the Forbidden Mountain. Kelli kept an eye on everyone’s bag while the rest of us rode. 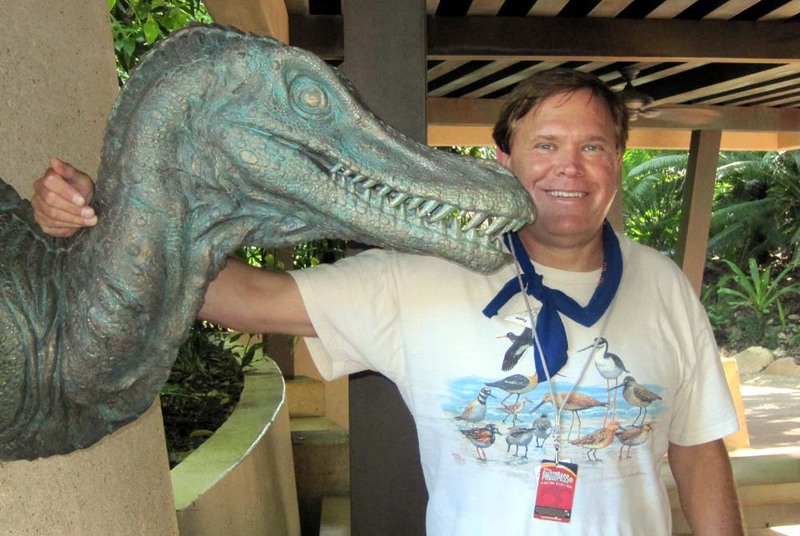 Our DINOSAUR fastpasses were getting close to expire so we had to make it quickly over there. We checked on Primeval Whirl. It only had a 20 minute wait so on we went – minus Kelli again. 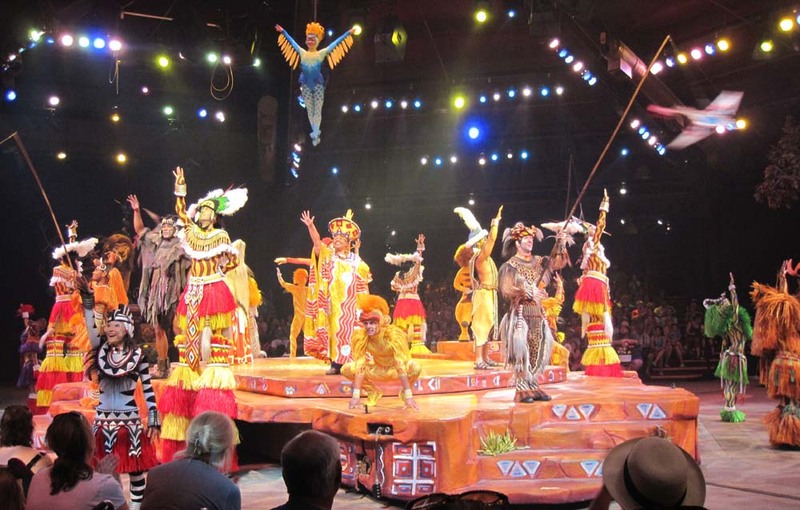 One must do for everyone, and especially for Kelli, who’s been patient with us on the thrill rides – is Festival of the Lion King. 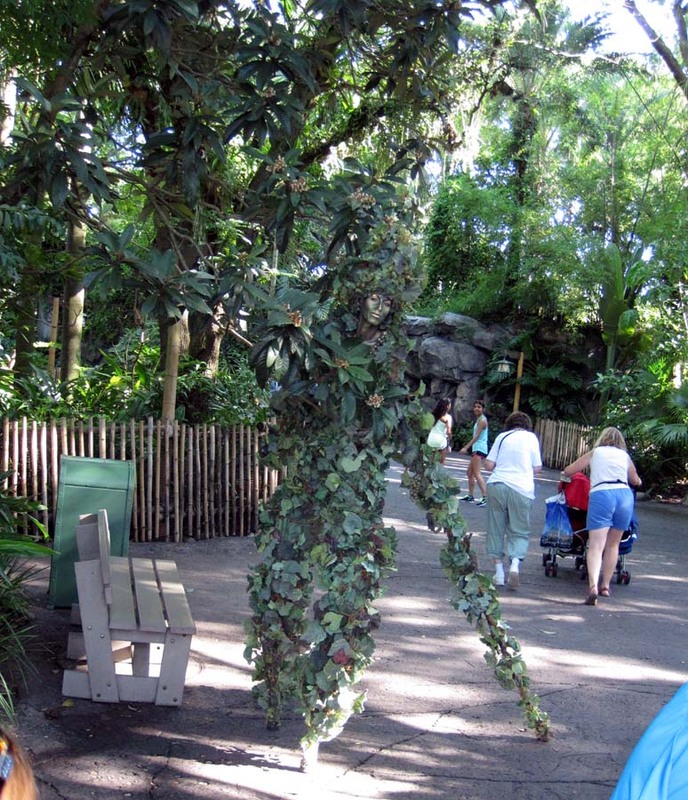 We headed that way, stopping briefly on Discovery Island to take a group photo in front of the Tree of Life. On the path to Camp Minnie-Mickey we came across a Great Egret. He had just caught a large skink (a type of lizard, possibly a Broad Headed Skink) and was shaking it to kill it before feasting on it. We were able to get some great pictures of the bird. 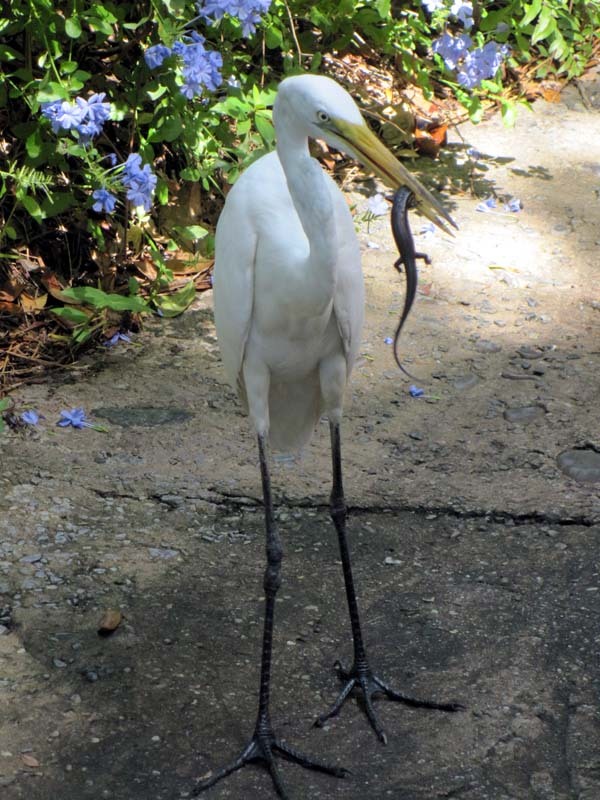 Great Egrets are 40 inch tall wild birds found year round in Florida and in much of the US in the warmer months. It is the symbol of the National Audubon Society. We needed the bathrooms before the Lion King and decided on the ones near the show. I was worried how crowded they might be since the last show had just let out. But the wait was short. There was a guitarist folk-singer in the area and I listened to a song or two while we regrouped. I later found out it was Gi-Tar Dan, a roving singer and storyteller. I made a note that next time to make time to listen to him more. We waited about 10 minutes before they let people into the show. I asked Kelli what animal section she would like to be in and of course she said Giraffe, so we sat in the first bleachers on the left. The show was great as always, there was a singer in the male lead we have not seen before and he did a good job, but I thought he was too skinny and young for the role. One of the stilt walkers scared these three young women in front of us a couple of times – great fun to watch. They seemed to like the extra attention. We left the park to relax at the resort. We have a 5:30 PM ADR for 50’s Prime Time Café this evening. The boys had an idea, based on the posted fast pass times for Rock 'n' Roller Coaster, seen on the My Disney Experience App; Rich could head over there and grab fast passes that would be good just before our ADR time. Rich ran ahead to catch a Hollywood Studio bus. We caught a bus back to Saratoga Springs and saw him still waiting for a bus. For lunch we did something I had hoped to do . . . use the grill at the treehouse. 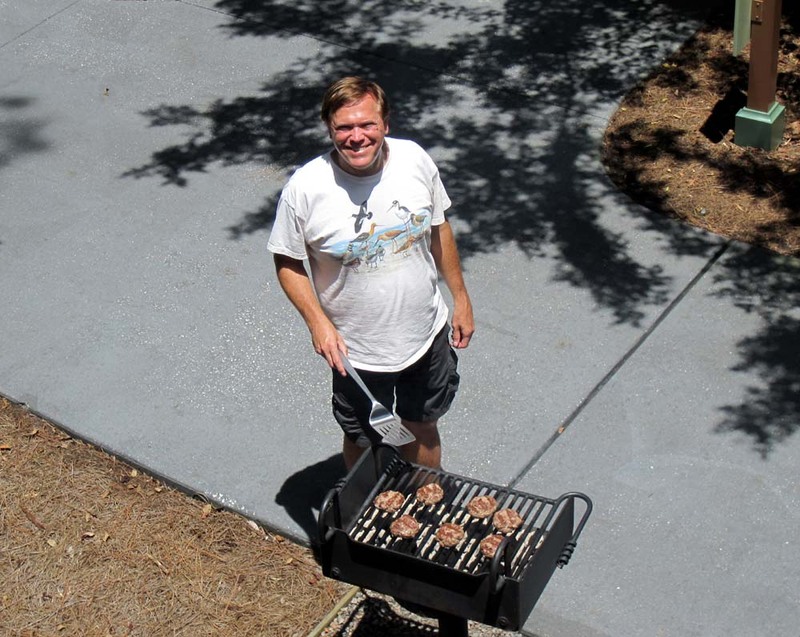 We fired it up with charcoal we bought earlier and made hamburgers. Rich had perfect timing and made it back just as the burgers were ready. 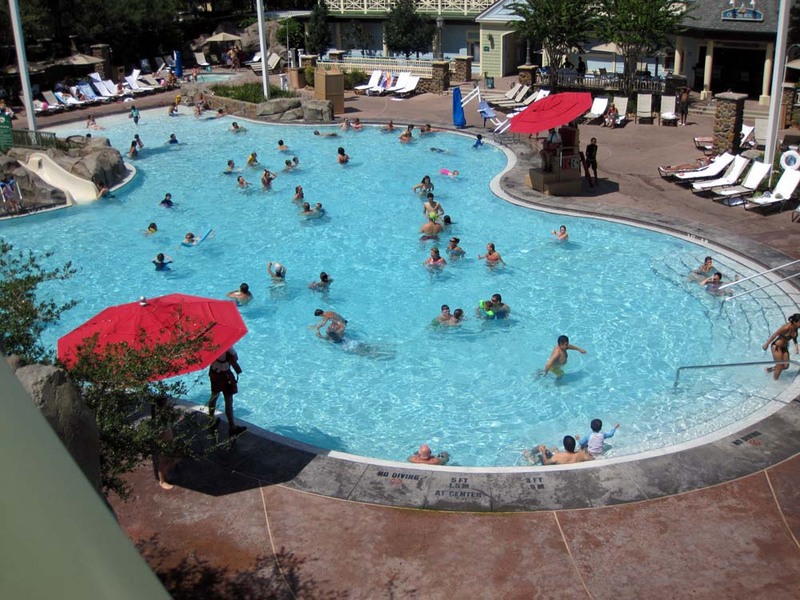 We changed into our swimwear and walked over to the High Rock Spring Pool to relax and check it out. It was hard to find an empty chair, but finally found one to use for our stuff. Once the shoes and shirts were off the short walk to the pool was agony! The cement was HOT! We cooled off in the pool and went down the slide a couple of times. The pool was having a trivia contest and although we did not officially play we tried to guess the answers to each other. We did pretty well. 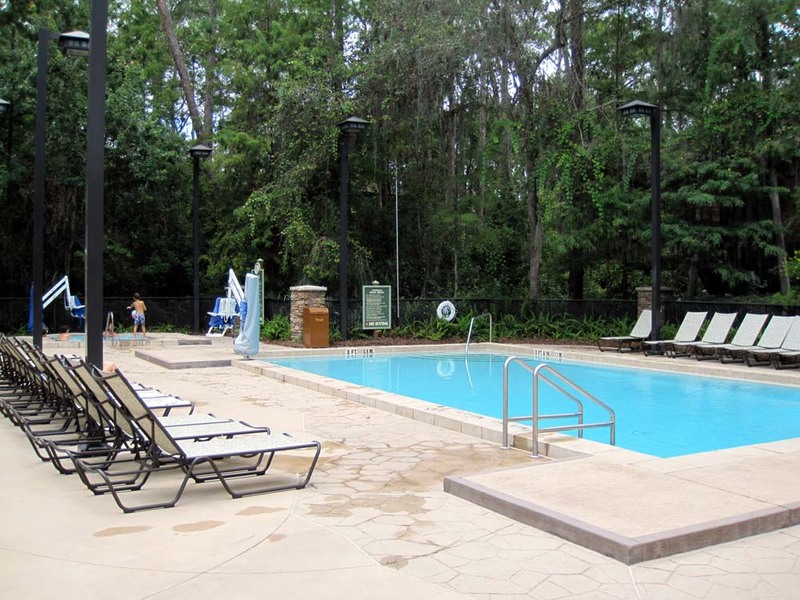 Reluctantly, we left the pool to freshen up for dinner and quickly caught a bus to Disney’s Hollywood Studios. 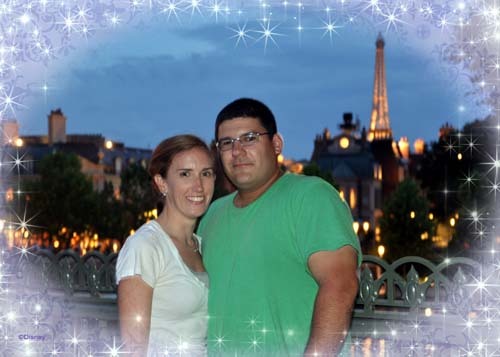 We took a few pictures in front of the park were they had the gates to Monster University with Sully and Mike Topiaries. We had very little time to get to Rock 'n' Roller Coaster Starring Aerosmith. Kelli and Marissa walked to 50’s Prime Time Café as we quickly ran over to ride. 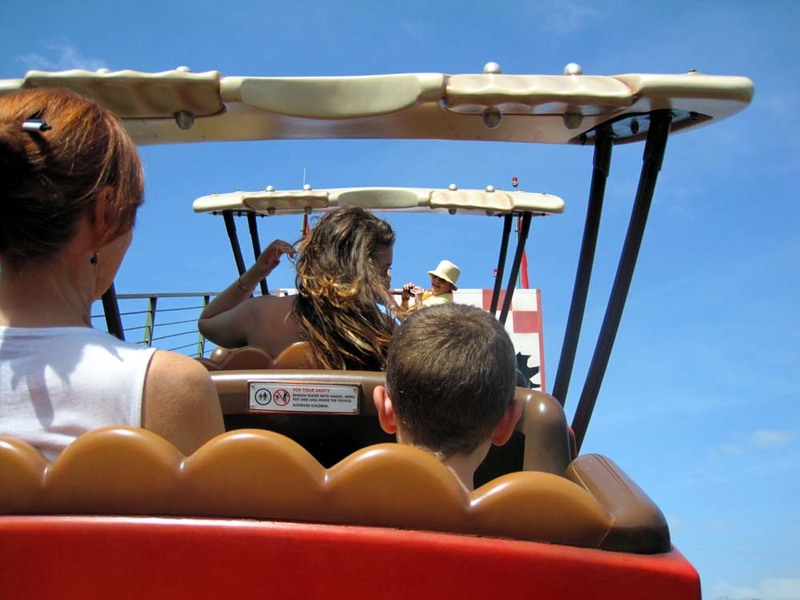 The coaster was as exhilarating as ever and we then had to hurry to Prime Time. We met up with Kelli and Marissa, they had already checked in, but we still had to wait a while for a table. Our “cousin” served us and he was friendly and attentive, but try as he might, Tim could not get into trouble. Maybe he was trying too hard. Our server pointed out the Peanut Butter and Jelly Milk Shake and I ordered it as my drink. It tasted just like a Peanut Butter and Jelly Sandwich. I let everybody have a taste of it. Tim ordered some Battered Onion Rings - served with Horseradish sauce. The food was good as always. I tried the Grandma's Chicken Pot Pie - A creamy cheese mixture of chicken, mushrooms, carrots, celery, onions, and peas topped with a flaky pastry. Kelli and Marissa tried the Caesar Salad with Salmon. The boys ordered the A Sampling of Mom's Favorite Recipes - Crispy-fried Chicken, Fork Tender Pot Roast, and Traditional Meatloaf with all the fixings, Aunt Liz's Golden Fried Chicken - served with roasted garlic mashed potatoes, chicken gravy and collard greens with bacon and Cousin Ann's Traditional Meatloaf - a blend of beef and pork topped with tomato glaze, roasted garlic mashed potatoes, and green beans. 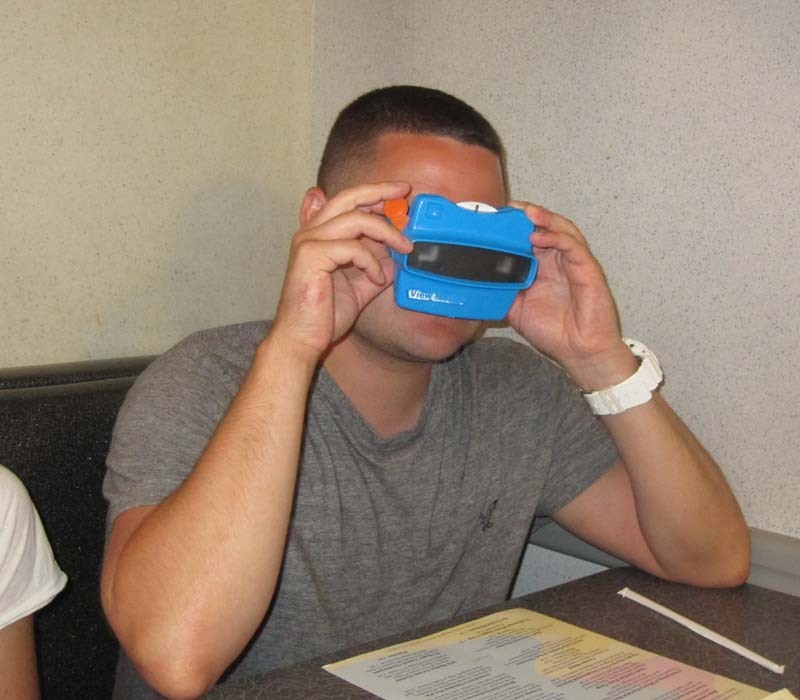 They still have the dessert menu on the old GAF View-Master. I was too full to order dessert. Rich liked the Peanut Butter and Jelly Milk Shake so much he had to get one. The others ordered a Root Beer Float, two S'mores and a Dad's Brownie Sundae. Our waiter gave all of us “Official Member – Clean Plate Club” stickers. We got the discount with the Tables in Wonderland card and my niece and nephews picked up the tab for Kelli and I. Rich, a notoriously slow eater, got the rest of his shake to go. We headed out of the park but not before I did a blind box vinylmation trade at the Villains in Vogue store. I received one of the ugliest vinylmations yet, I think it is a lady wrestler from the Extreme Wrestlers series. We stopped to get a group picture and Rich’s shake was accidentally knocked out of his hand and we made a mess on the street. Sorry Rich. 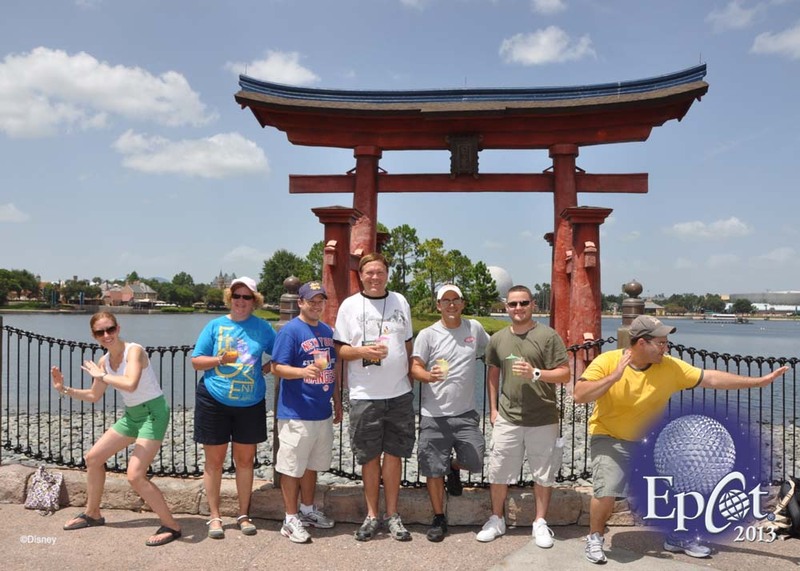 Our first stop in Epcot was France for three Grey Goose Citron Lemonade Slushes and a couple of wines. That was followed by a few beers in Germany. In China I tried the Canto Loopy - with Vodka and Cantaloupe juice. 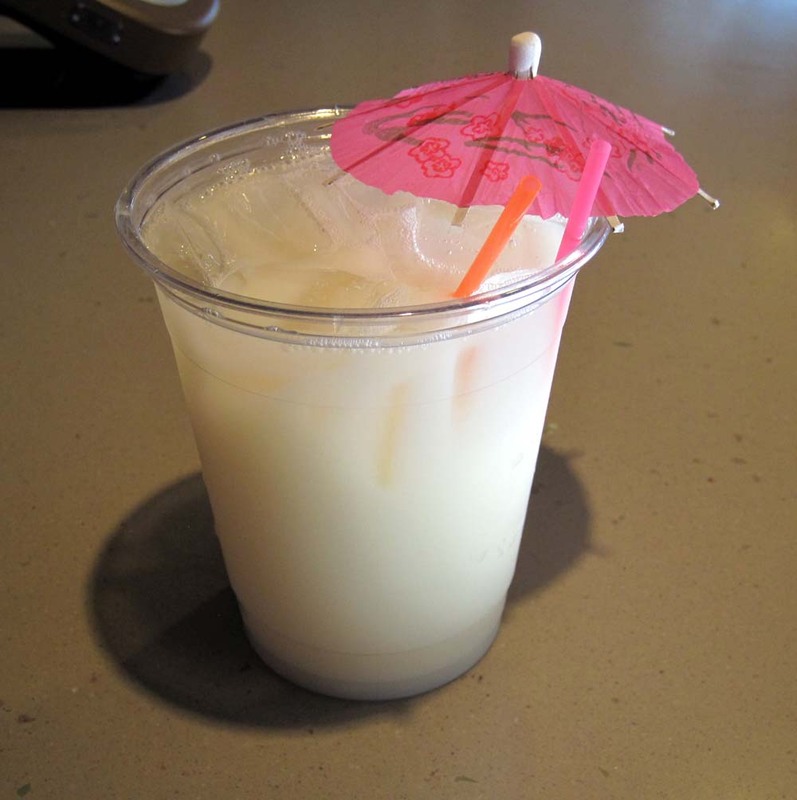 Mike was also on line, discussing the Canto Loopy drink with a young lady, laughing at its name. Although she ordered one – something was wrong and she walked off without one. Thinking perhaps she did not have enough money – Mike spread a little pixie dust and brought an extra Canto Loopy drink and took it over to her. She was pleasantly surprised and very thankful to him. We decided to see IllumiNations: Reflections of Earth from the bridge between Mexico and the Showcase Plaza. Kelli and I stopped for Lime Frozen Margaritas while the others found a spot for IllumiNations. They found a spot on the bridge with enough room for two at the railing. This is a good spot as the bathrooms are nearby at the Odyssey Center – Important when drinking around the world. We waited for 30 minutes for the show to start while making trips to get a beer or margarita. After IllumiNations we let the crowd thin a bit then used the nearby bathrooms before heading to the front of the park. Spaceship Earth was a walk on so we did that then spent some time in the Siemens post-show experience - Project Tomorrow. Tim and Marissa tried Body Builder – a 3-D game that challenges guests to reconstruct a human body while Mike and Kevin did Power City – a large, digital "shuffleboard-style" game that has guest racing around the board to power their city. They thought they would compete against each other (hey, they are brothers!) – Little did they know till they started that they had to cooperate to get a high score. Our travel back to the Treehouse villa was not without adventure. Saratoga Springs had turned on the sprinkler system. The path from the Grandstands to the Treehouses was now a water spray obstacle course. Jets of water were crossing the paths, slowly working back and forth. You had to time each move on the path or jump the water jets not to get soaked. I felt like I was on the Wipeout game show. It was a long day. Tim’s three brothers will be heading back to NY tomorrow, then it will just be the four of us for the remaining three days. I woke up very early, Mike and Rich had a 5:15 AM DME pickup time for their 7:15 AM flight back to NY. They were packed and ready and I drove them over to the Carriage House. I got back to the treehouse for another 45 minutes of sleep before getting up for the day. 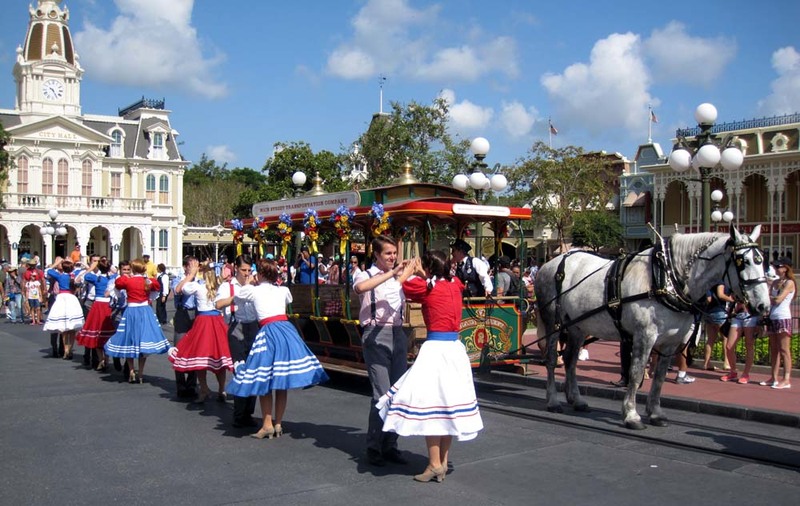 Tim, Marissa and Kevin would be starting at the Magic Kingdom. Kelli and I had an 8 AM ADK to try Boma’s breakfast buffet. Kelli and I left before them and we drove over to the Animal Kingdom Lodge. I missed a turn and had to back track to the Lodge, but we were there by 8. Boma was empty and we did not wait long. The buffet had the expected breakfast foods. There were just a few unique items such as a ham carving station, Turkey Bobotie, and delicious eggs with spinach, tomato and feta cheese. We both tried the Jambo Juice, I liked it but Kelli let me finish hers. There was also a decadent French Toast Bread Pudding with an amazing Pecan Praline Sauce. In the end Boma for breakfast was good, but nothing special, we still love Boma’s dinner buffet. We were still glad to try it, but won’t go out of our way to come back. 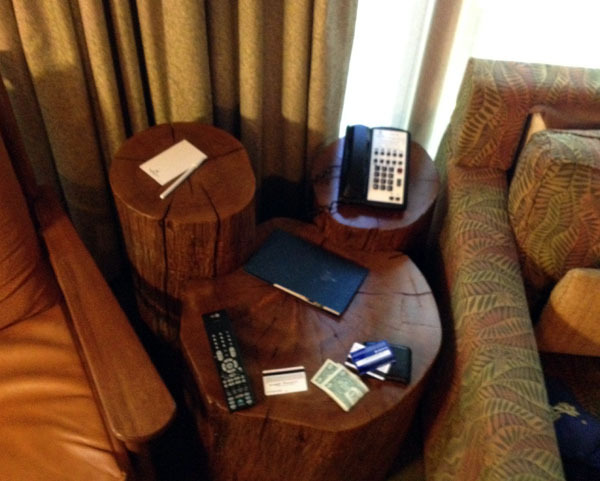 We might do it again if staying at the Animal Kingdom Lodge. We headed back to the villa and then took a bus to the Magic Kingdom to meet up. Our bus had a Phineas and Ferb Mission Marvel overlay. Once under the train station in the town square, we paused to watch and listen to the Main Street Trolley Show. We were meeting at It’s a Small World. Before getting there Kelli and I picked up fastpasses for Peter Pan. Much to Kevin’s delight, we all rode “It’s a Small World.” With the tune firmly implanted in our heads; we headed over to Splash Mountain. They had an extra fastpass for me so the four of us went on while Kelli looked for us at the long turn near the end of the ride. Somehow Tim got his wife Marissa into the front seat of our log. I do not think she was too happy. Kevin and I were right behind them. We all got wet but Tim and Marissa got the brunt of it. It was hot so it felt good. The boys headed to Thunder Mountain. Kelli and I needed a more relaxing day so we did Peter Pan with our fastpasses and then walked right into Mickey's PhilharMagic. We started to head out, but watched some of Move It! Shake It! Celebrate It! Street Party and did some shopping along Main Street. While waiting for a bus I got a picture of the new Iron Man 3 Monorail. Tim and Marissa caught up with us at the bus stop; each carrying a Disney Starbucks iced coffee. 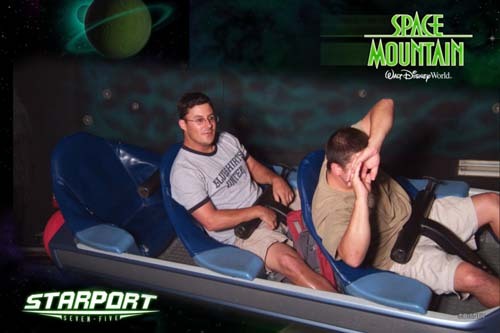 Kevin headed for Space Mountain for one last thrill. Kevin finished packing for his evening flight back home. I drove Kevin over to the Carriage House for his DME bus. 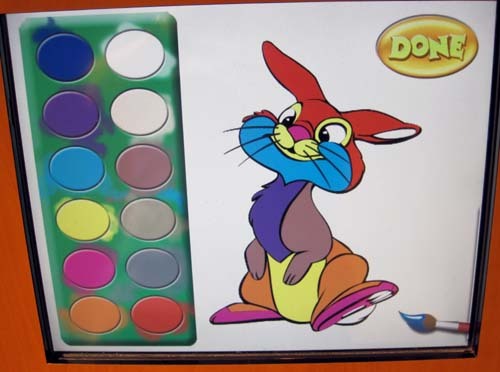 It gave me an opportunity to run into Artists Palette and buy some exclusive DVC and AP pins and a DVC member shirt. I also picked up more cheese and chips for snacking. Kelli and I had dinner at the Wave in the Contemporary. We drove over. There was rain threatening and we got a close parking spot. I realized that we have had great weather so far. The forecast for the week we were down was a chance of rain or thunderstorm each day, but it never rained when we were outside. 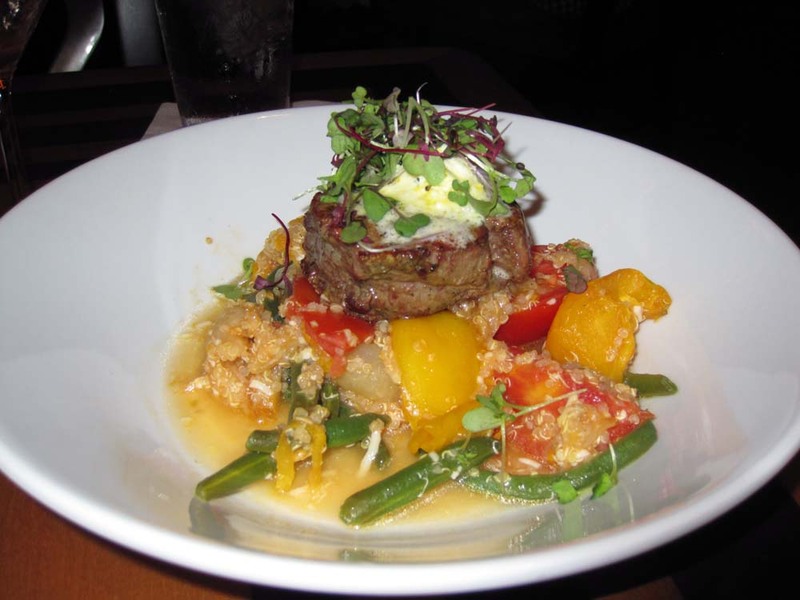 The Wave has a limited menu, but it ensures that all the dishes are done right. We were again delighted with our meal here. We had a friendly waiter, who maybe talked too much, and was confused at times, but nothing to spoil our dinner. We started with a couple of interesting drinks. Scottish Raspberry Lemon Drop for Kelli and I tried the Habanero Lime Margarita. The margarita had some heat in it. We skipped appetizers since the last time here we were too full for dessert. Kelli enjoyed the Herb Salt Seasoned Beef Tenderloin; Tomato Green Bean Salad with Cypress Grove Creamery Lamb Chopper Cheese and Citrus Herb Butter. 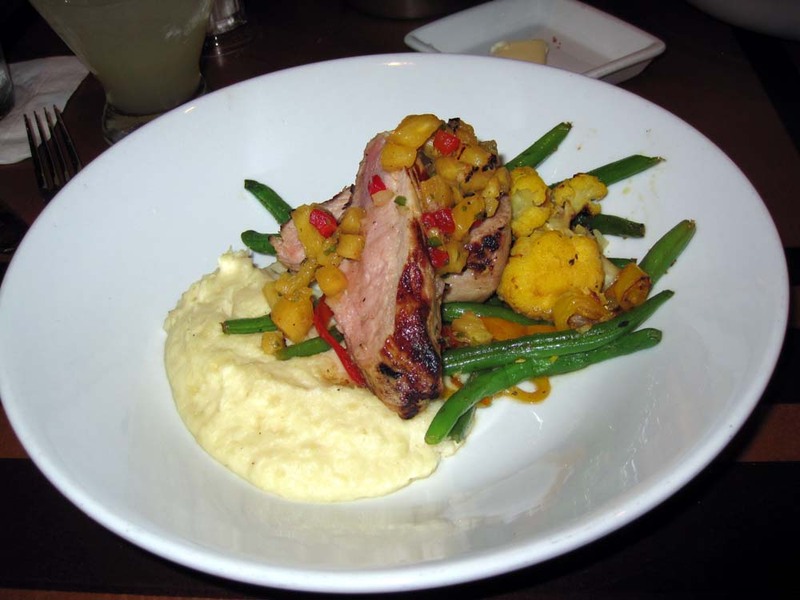 I had the Thompson Farms Pork Tenderloin; Soy, Pineapple Honey Marinade, Pineapple Salsa, Boniato and Cauliflower Mash. We both really like the way the Wave does dessert; they had collections of three small desserts. Kelli selected the Creamy Indulgence which had a Chocolate Truffle mousse, a NY Cheesecake, and a Coconut Panna Cotta with Passion Fruit Glaze. I enjoyed the American Flavors Trio which had an Almond Raspberry Crumble, a Key Lime Pie and a Banana Brownie Sundae. We really enjoyed the meal and walked it off by shopping upstairs in Contemporary’s two gift shops. We had planned a quick foray into the Magic Kingdom, but the rain was still threatening and we wanted to get to Animal Kingdom at opening tomorrow so we just drove back to the villa. Good thing we did. We were safety back in the villa when the skies opened up. I spent the rest of the short evening down loading pictures into the computer and putting some up on FaceBook. By the way, internet access from this treehouse villa was excellent! The plan was to hit Animal Kingdom at opening, ride Kali River Rapids as much as possible and slowdown and enjoy some of the animal exhibits. We finally left on time. With only four of us I decided to use the car. Half-way there Marissa realized she did not take her allergy medication. I had no problem turning back; it is hard to enjoy a park if you are feeling miserable. Marissa was quickly in and out of the treehouse and despite having to park at the end of a long row and wait for a tram; we still made it to Animal Kingdom just after opening. After the turnstiles we went to the right and saw Ms DeVine in the Oasis and I took a couple of quick pictures. Marissa ran ahead to get three Everest Fastpasses. As we approached Asia, we heard this weird sound. It was the White Cheeked Gibbons howling in the towers outside Kali. We grabbed 8 fastpasses for Kali River Rapids. You may wonder, how did we do that? (Eleven fastpasses in all) We had Mike, Rich and Kevin’s cards for the treehouse which enabled us to get 3 extra fastpasses. We used the new free lockers to store our stuff so not to get them wet. 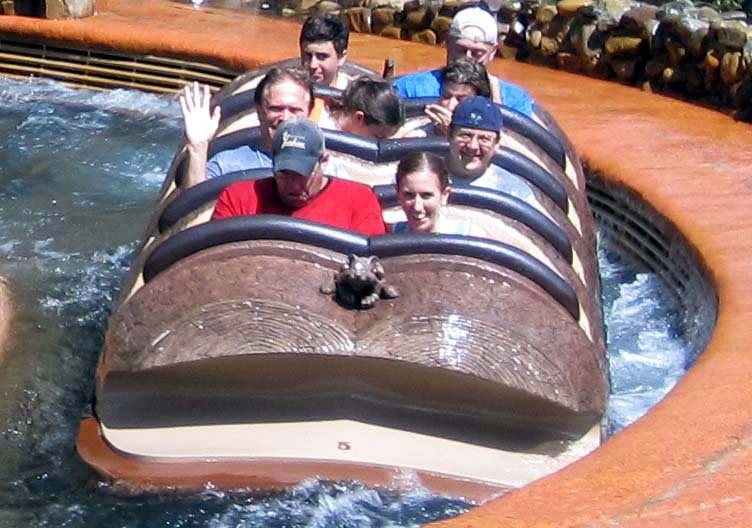 We rode Kali River Rapids using the standby line, then two more times with our fastpasses, we were all soaked. We had to dry out a bit. Kelli stayed in the area while Tim, Marissa and I ran over to use our Expedition Everest fastpasses. 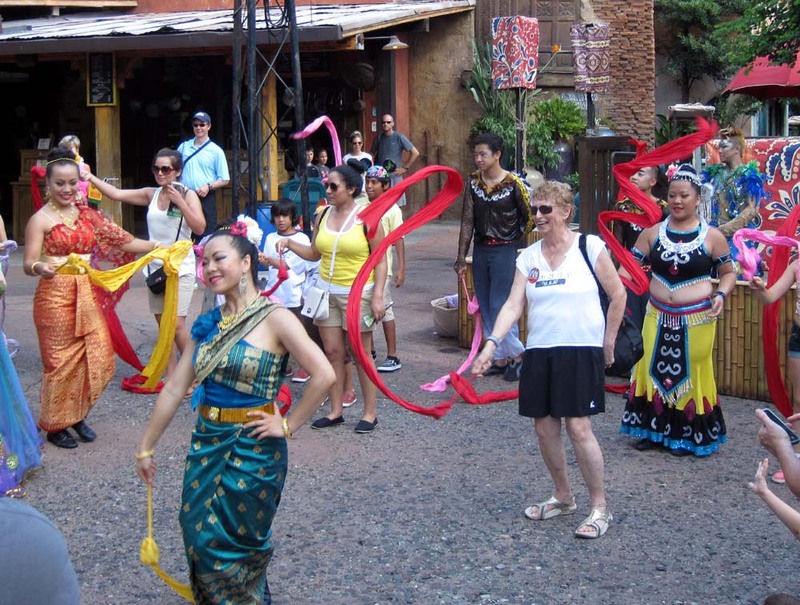 On the way I noticed a group, both guests and cast members, dancing with ribbons near Yak and Yeti. It was the end of the Story Dancers. Asian dancers in ornate costumes tell stories through their moves and the accompanying music. At the end, the audience is invited to join in. We were on and off Everest in a flash and were quickly back with Kelli. We walked the Maharajah Jungle Trek. A Komodo Dragon was out and we saw a few tigers. We lingered with the giant fruit bats and then the birds. We hit the Outlet stores. I explained to Tim and Marissa they are hit and miss. Our first stop was the Disney Outlet at the Lake Buena Vista Factory Stores since it was easiest to get to from Animal Kingdom. We did not find anything except a few pins so it was off to the Disney Character Outlet at the Orlando Premium Outlets on Vineland Ave. I found some vinylmations including the Park 8 topper. Marissa scored big with a I Finished the 2013 Princess Half Marathon shirt. She completed it in February but left that day of the marathon. And it was 25 percent of the original price! 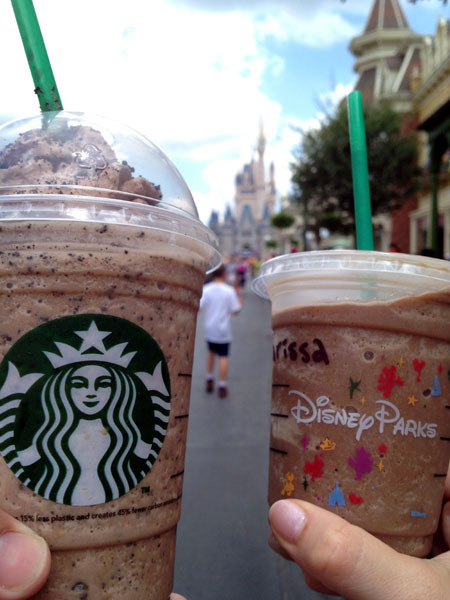 We ate at the outlet’s food court, grabbed some Starbucks and headed back to Saratoga. We took a quick dip in the pool and then took the boat to Downtown Disney for dinner at Ragland Road. As always the food and entertainment was excellent. We had a great table for four near the bar with good views of both stages. We all commented on how good the Guinness bread dipping sauce for the soda bread was. It is a Guinness reduction with some sugar added. I have to try to make this at home. 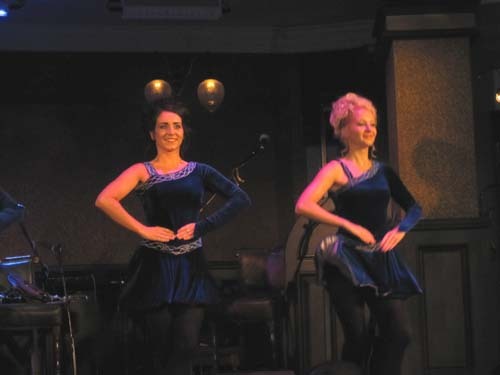 The dancing and the band were great and we sang some kind of Irish drinking song. We skipped dessert. 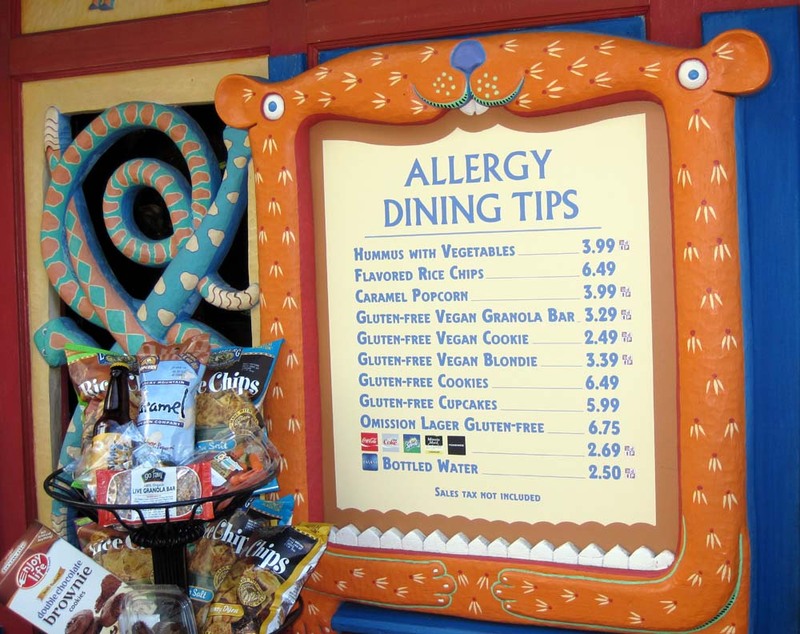 The Tables in Wonderland card deducted $20.20, with the 18 percent gratuity added the bill was only $102.94. I like that at the top of the bill it says, Here’s the Damage!! We walked over to Pin Traders and the shopping commenced! 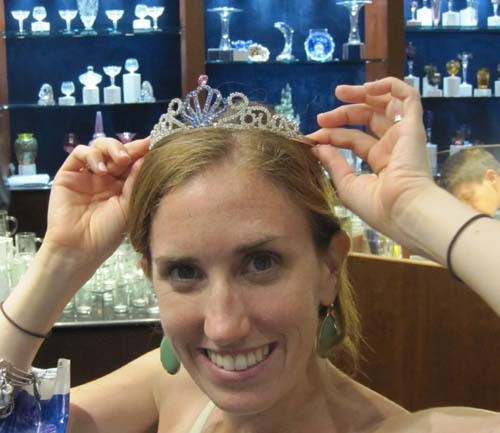 We hit TrenD and worked our way to Arribas Brothers where Marissa bought a tiara. We stopped at Ghirardellis for ice cream and sat outside. 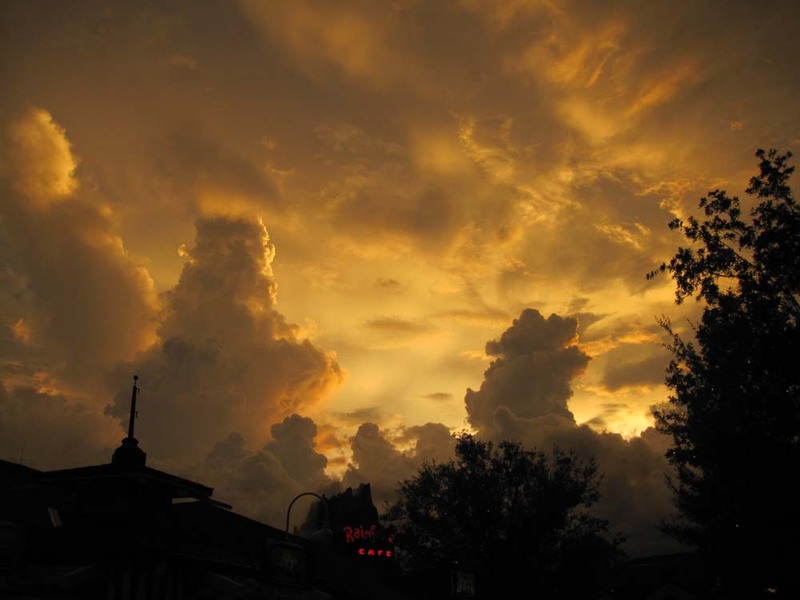 The clouds at dusk looked cool and we saw the volcano over the Rainforest cafe erupt a few times. Next was The World of Disney where our wallets were lightened. After perusing the Lego Imagination Center we slowly walked to the West side enjoying the music and entertainment along the way. Kelli and I were tired so opted for the boat. 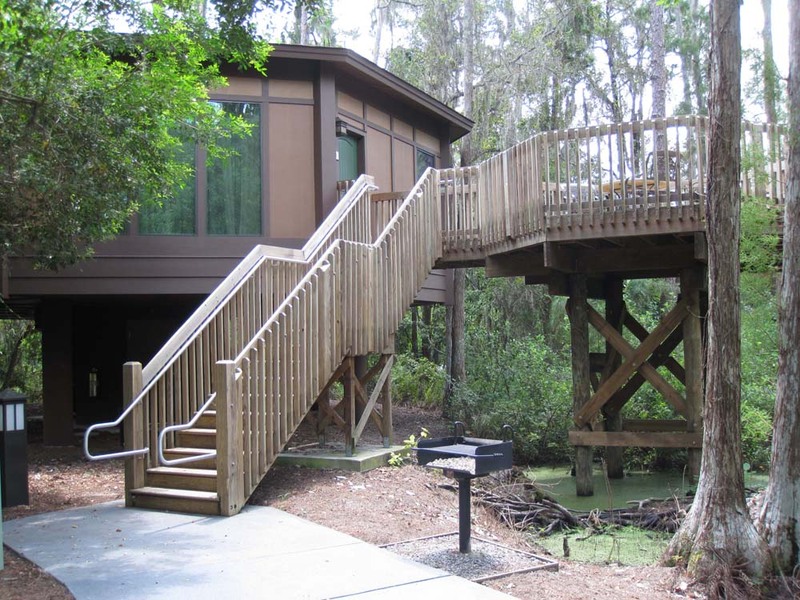 Tim and Marissa walked backed to the treehouse using the path behind the Cirque Du Soleil parking lot, then the path along the water from the Saratoga Springs bridge and the service path bridge at the treehouses. They made it back well before us! We waited over twenty minutes. Disney brought in an extra boat. It had a red flag, ours would be blue. They asked if anybody was going to the Treehouses and we said yes. 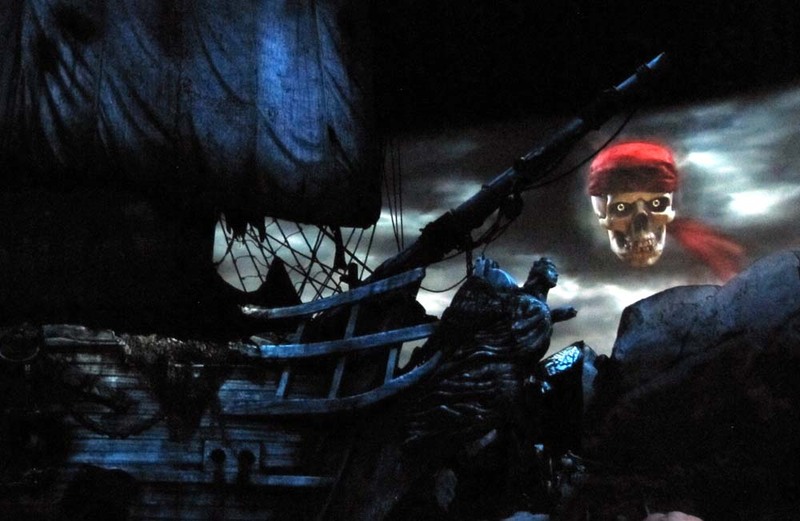 They were not happy since their plan for the extra boat was just to go to Saratoga Springs. But they did bring us to the treehouse dock after dropping everyone off at Saratoga. It was a good thing they did, we picked up two guys who wanted to take the boat from the Carriage House to the Treehouses. The men thought they would beat their wives and kids who walked by taking the boat, when in fact, it was the other way around. Tim and Marissa also beat us. Tim was standing on the deck enjoying a cigar and wondering where we were. On our last full day we decided on separate itineraries so that everyone could enjoy anything they missed during our stay. Kelli wanted relaxation and sleep; so she slept in then read out on the deck. 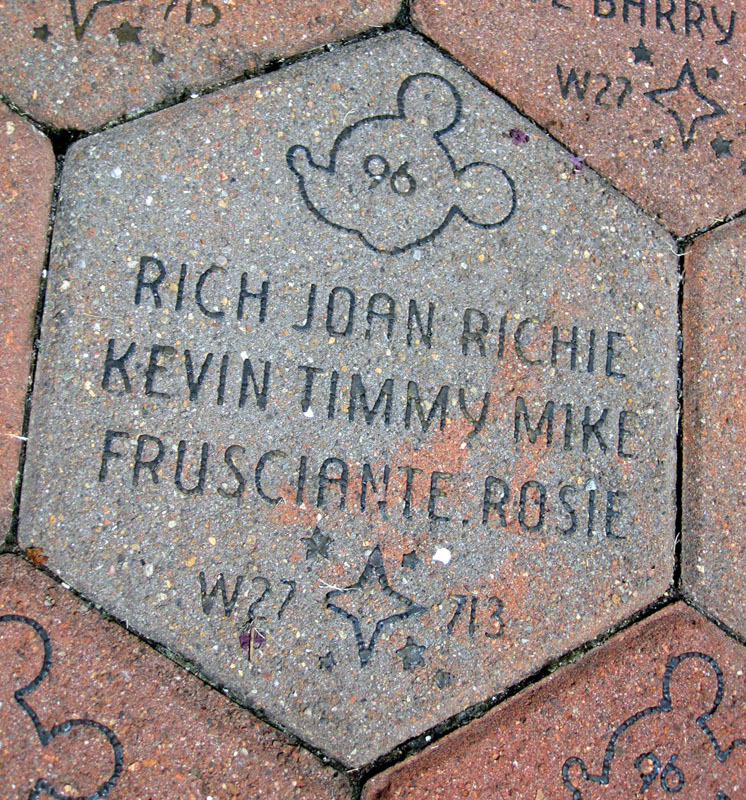 Tim and Marissa headed for the Magic Kingdom to look for the family brick in the walkway and enjoy the park. I headed out to Epcot which had early entry. 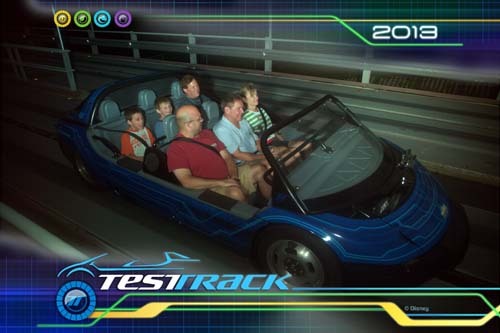 I had yet to experience the new Test Track and still had the Sum of All Thrills on my to-do list. I headed straight for Test Track, resisting the urge to turn right for the land pavilion. There was a small line at the entrance which was growing. Test Track was down and after 5 minutes I decided to bail and get a fastpass for 9:05 AM. I headed for the Sum of all Thrills in Innoventions East but that did not open till 9. With my extra hour plans ruined I made the best of it and searched for a new AP pin that was rumored to be available but they did not have it. I had heard about a great bread pudding at the land pavilion so headed there. I relaxed and enjoyed my Croissant Berry Bread Pudding in an empty Sunshine Seasons food court. The bread pudding was very good, But not as good as the French Toast Bread Pudding with the Pecan Praline Sauce we had at Boma on Wednesday morning. The Pecan Praline Sauce was just so good. I would do the bread pudding at Sunshine Seasons again if I had the chance. I did Living with Land with only two other people on our boat. I could scoot from side to side to get good pictures of everything. I noticed both visually and by smell that they had lots of herbs and spices growing. The peanut butter tree always intrigues me. It was finally 9 AM and I headed over to Raytheon's Sum of all Thrills, a roller-coaster simulator ride in which you design the coaster track on a computer, then you climb aboard a giant robotic arm to experience your creation. There was already a line and I was with the third group in. The experience was both educational and thrilling. I of course did a loop first, then some spirals. Next time I will try something different. Next up was Test Track. I designed a cool looking but not too efficient car and rode. I liked all the neon lighting. The interactive part designing a car is a nice addition. I headed back to the villa and relaxed with Kelli out on the deck. We found a Northern Parula flirting above us in the trees. It is a colorful warbler (bird) that breeds in the woods around here. We headed over to the Artists Palette for lunch and more shopping. I tried the Beef on "Weck", Sliced Roast Beef, Au Jus, and Horseradish on a Kummelweck Roll with House-made Chips. So far nothing on the menu has been disappointing, every choice has been good. I could get addicted to the house-made chips. Kelli was looking for the 2013 Disney wash cloth, we get one for each year, but she was disappointed that she could not find one. She had seen them early in our trip and had thought she could pick them up anywhere. I told her that we still have a chance at the shops around the Epcot resorts later tonight. All four of us relaxed at the pool one last time in the afternoon. When I got out, dried my hair and put my tee-shirt on, Kelli started laughing. 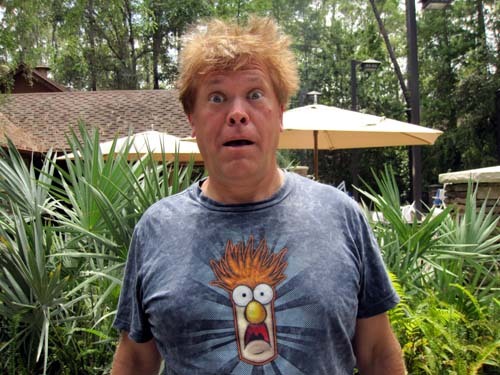 She said I looked like Beaker from the Muppets that was on my T-shirt. 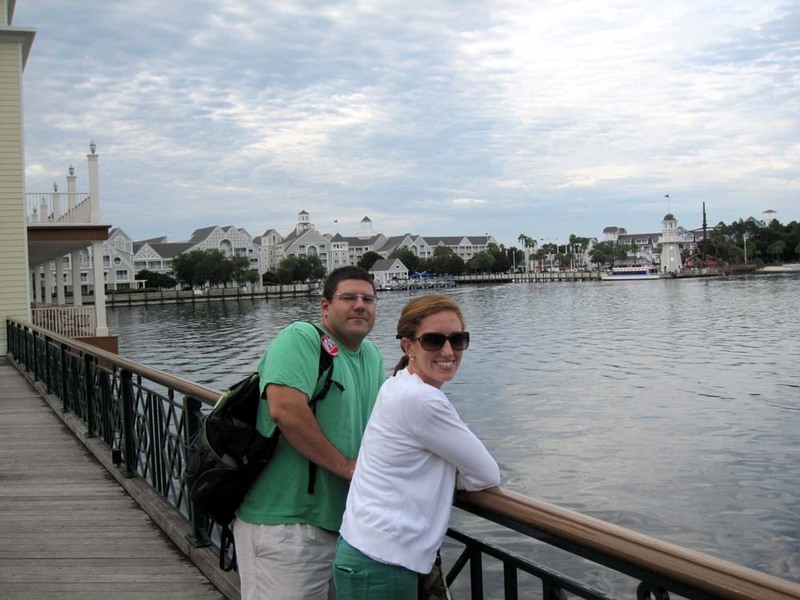 I suggested the Big River Grille and Brewing Works for dinner so that we could experience Crescent Lake and the Epcot resorts in the evening. And according to some opinions on MousePlanet, they have the best burgers in the World. We drove over and valet parked at the Boardwalk. 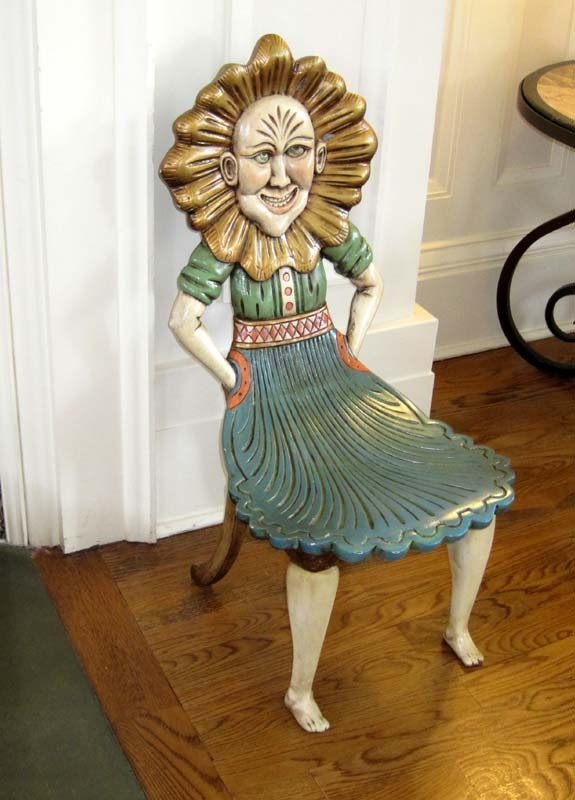 First on the agenda was to show everybody the creepy chairs in the lobby. Big River Grill had a twenty minute wait so we took some pictures out on the boardwalk and enjoyed the nice weather. We sat inside. The tables are a bit close together but we had a great waitress. She was fast, friendly and could carry 5 or 6 plates at a time. For dinner we ordered the Jalapeno Spinach Cheese Dip, two Big Brew CheeseBurger. Hickory Bacon Burger, one with onions, the other with the sweet magnolia barbecue sauce on the side and a Grilled Chicken Cashew Salad. The burgers came with some great kettle chips. The burgers are huge and lived up to their reputation. The cheese dip was good and not too hot for the others in my group. They took the Tables in Wonderland card and Tim and Marissa again treated us. We walked off dinner on the boardwalk. We stopped and enjoyed the hat spinning guy. He was funny and while balancing an extremely tall pole on his forehead with the basket at the top, made an incredible basket with a small basketball. We shopped in Thimbles & Threads, Boardwalk’s gift shop. Kelli found her wash cloth plus a couple of items she was also searching for. Successful shopping always brings a smile to my bride’s face. Afterwards, we enjoyed the last part of a juggler act then decided to get dessert. Tim and Marissa back tracked for some ice-cream. Kelli and I looked in the Boardwalk Bakery. She had a napoleon while I tried the Peanut Butter Banana and Candied Bacon Pie. Kelli was a bit disappointed in her dessert. The napoleon was not the traditional type found up here in New York. My dessert was great. 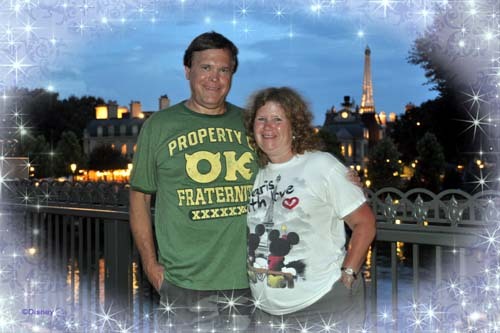 It was a great comfortable night for a stroll and I suggested a walk over to Epcot for IllumiNations. Tim thought that the walk would be far, but we were near the ESPN Club so the walk was only a few minutes. After entering though the International gates we found a photopass photographer for some last pictures. After that went to the right, crossed the bridge and then down the stairs next to bridge. While waiting we saw all the boats pull up next to us for the IllumiNations cruises. We enjoyed IllumiNations for a second time and Marissa posted on FaceBook that it was a great way to end our final evening of vacation. On the walk back Tim checked on the Yankee game outside ESPN club. After that both of us couples enjoyed a romantic night stroll enjoying the lights of the boardwalk. Getting back to the resort was easy. I showed my Tables in Wonderland card along with the Big River Grill receipt to the valet, for free valet service, got the car within minutes, gave the valet a good tip, and had a short drive to the villas. This is our last day. We have a late afternoon flight and we have yet to get on Toy Story Midway Mania. Fortunately Hollywood Studios has early entry today so we all got up early. All the waffles, eggs, bacon, sausage we had left was made and devoured and we left on time by car. We walked in from the parking lot, crossing the road the tram uses, to pass through a single manned security line that had no wait. This friendly security guard called Kelli and Marissa, “princesses” and we had a 10 minute wait before opening. After entry, Marissa sped ahead for Toy Story fastpasses and met up at the standby line. With all the people ahead of us at opening our fast pass times were already at 9:50AM. The posted wait for standby was 35 minutes but it was more like 20. 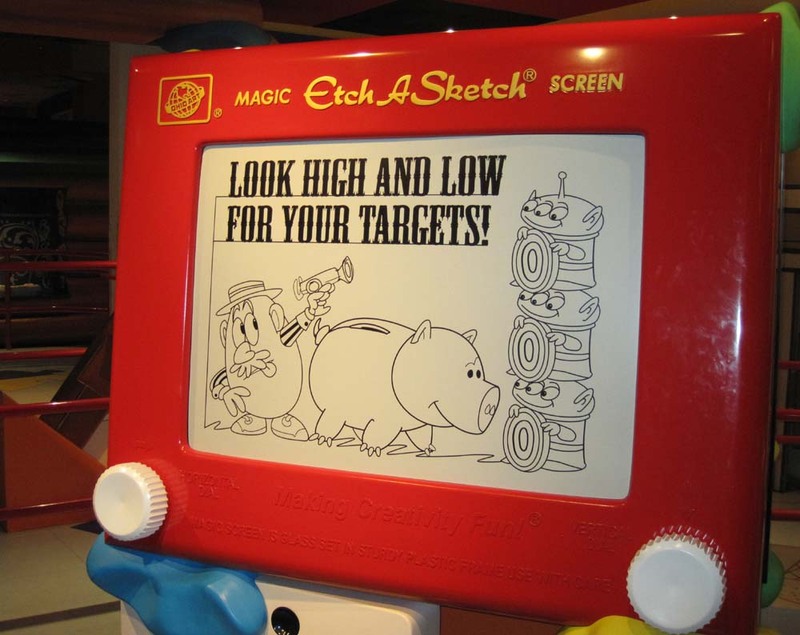 We saw the new etch a sketch in the queue and Mr. Potatohead was a bit quieter for the early crowds. We rode Toy Story, with all of us scoring OK. We had a lot of time before our fast passes were good so we did the Legend of Captain Jack Sparrow. I thought it was incredibly well done. The others were glad they saw it, but like most people, felt it was a one and done type of thing. 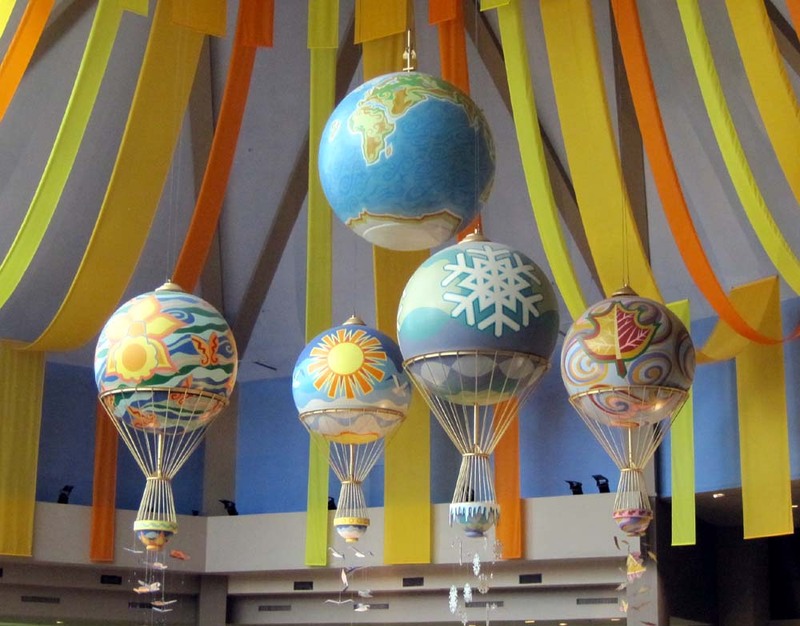 We headed over to The Magic of Disney Animation and explored an empty pavilion. We did the interactive stations. One which asked you questions to see which character you are most like. Then we did the paint a character featuring Kronk. 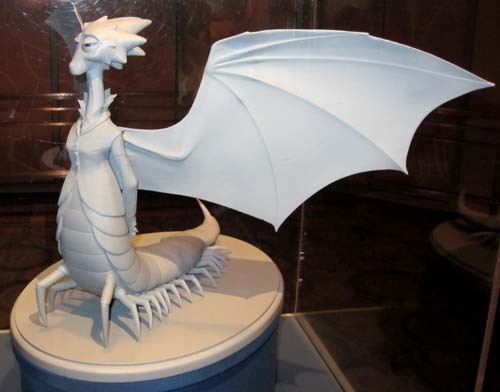 The gallery featured Monster University miniatures including Dean Hardscrabble, Mike and Sully. We had our final ride of the trip using our Toy Story fastpasses. The line took longer than expected and we had to leave right away so that we could vacate the Treehouse villa by 11 AM. Back at the resort we packed up the car with our luggage and left right at 11. We drove over to the Carriage House to check in our bags and get our boarding passes. We are flying JetBlue and everything went smoothly, unlike the last time when we flew Delta. We took some last minute pictures of us in the carriage and the winners circle outside. Then we headed in to the Artist’s Palette for one last refill. I also decided to buy a Saratoga Springs tee shirt I had been eyeing all week. We drove over to the Hess gas station near Hollywood Studios to fill the rental car then drove down to the Art of Animation resort for lunch and a look around. Hint, you can fill up at any of the Hess gas stations on Disney property and drive the twenty miles to the airport without the gas gauge moving, it still will read full. Tim and Marissa will be back down here in just 3 weeks for a short vacation before school starts in New York. Due to the Jewish holiday occurring early; school will not start till the Monday, a week after Labor Day. 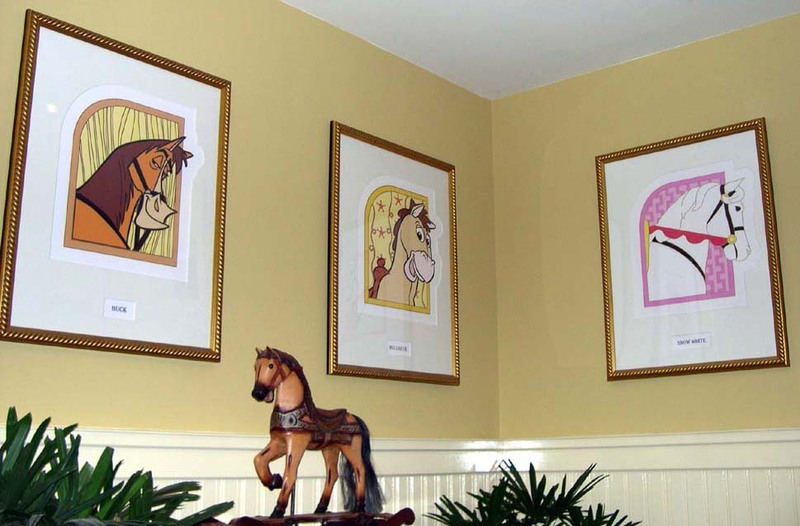 They will be staying in an Ariel room at Art of Animation. This will give them an opportunity to look around. Plus the Landscapes of Flavor is a good place for l unch before heading to the airport. The food here is probably the least ordinary of the value resorts. For lunch I had the Tandori Boneless Chicken Thigh with Roasted Cauliflower, and Roasted Acorn Squash. Afterwards we could not resist shopping one last time in their store, the Ink and Paint Shop. We also shopped in the Disney store for some treats for work. Our plane left on time and was uneventful. We landed 30 minutes early, but had to wait for Rich who got stuck in bad traffic on the Whitestone Bridge. The humidity was so much less, the wait was easy. We got home to a waiting pizza, thanks Joan!